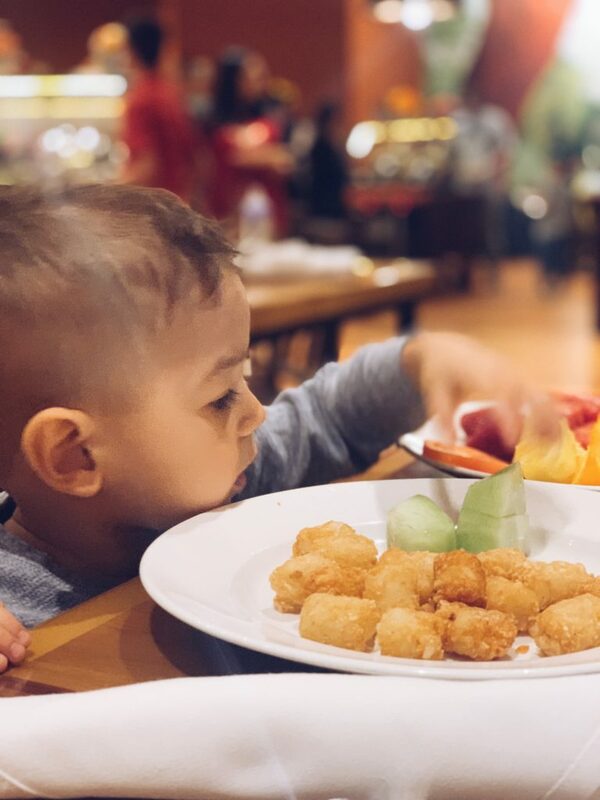 Our family LOVES to visit Great Wolf Lodge in Southern California and we go at any chance we get. It’s the perfect family getaway that has everything under one roof, for all ages. From water fun to mini golf, bowling and a magi quest game throughout the resort, the fun is literally endless. 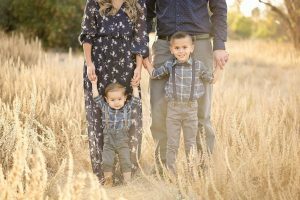 There is no hassle of buckling the kids in the carseat to go anywhere because everything is an arms reach away, including meals. And the absolute best part about it is that they pride themselves on being incredibly vegan friendly. Every single visit, we are spoiled by the amazing Executive Chef, Hany Ali. Chef Hany is very well versed in the importance of families with allergies and dietary restrictions. From our experience, many theme parks and chefs have limited knowledge on how to make special accomodations that actually taste good. Not only is it delicious and adventurous on a vegan scale (let’s face it, we are usually pretty limited, unfortunately) but he is genuinely more than happy to make vegan modifications. And as one server put it, Chef Hani truly adds the special magic to your dining experience at the Lodge. If he’s not there, he will ensure that someone else will take care of you! As vegans, we have always been welcomed with open arms, with Chef Hany and his team ready to serve. You can rest assured that your family will eat well during your stay! The main restaurant is called Lodge Wood Fired Grill. They serve lunch and dinner here and it’s considered the nicer dining at the resort. Look for pictures below of our meals here! 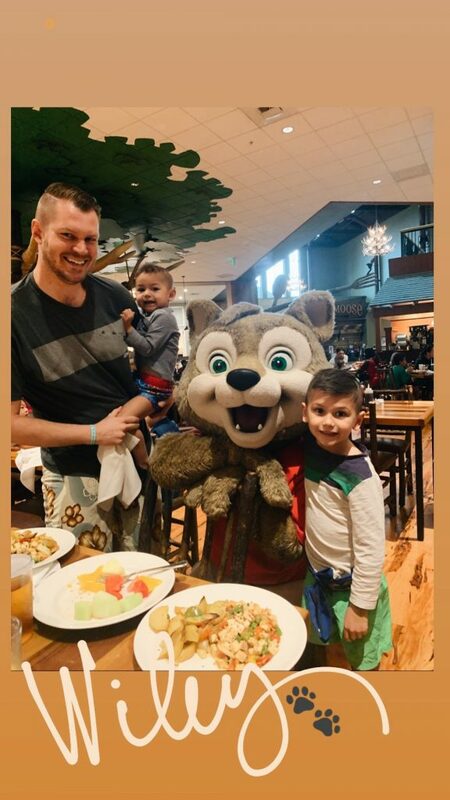 Loose Moose Family Kitchen is a large buffet that we found great for breakfast–and you get to meet the characters while you dine! They have several vegan options (see photos below), plus three kinds of fresh made salsas that are my absolute favorite. Hungry As a Wolf is a quick pizza joint, right next to the waterpark. They serve GF vegan pizza that you can add any veggies to (and possibly vegan sausage if they have it on hand). The vegan dough can be either GF or a regular vegan dough option, depending on which chef is working. Dunkin Donuts serves quick breakfast potatoes, in a non-shared fryer. They also have oatmeal, bagels (sans any kind of vegan spread, unfortunately) and soy milk for your coffee. Sweets and Eats downstairs serves a few vegan sorbet ice cream flavors, as well as the one flavor of vegan Dippin’ Dots. You can also find Dippin’ Dots inside the waterpark. 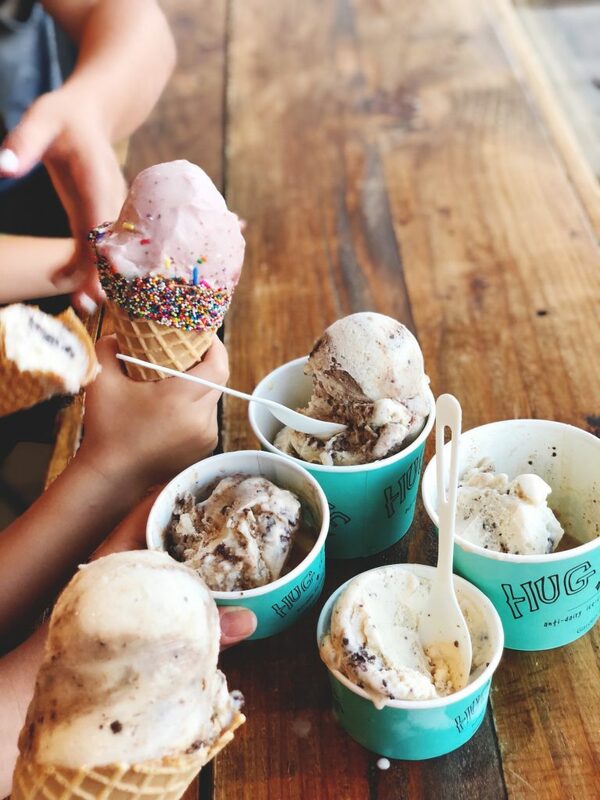 They have atleast one vegan cone, so your vegan kid doesn’t have to feel left out! 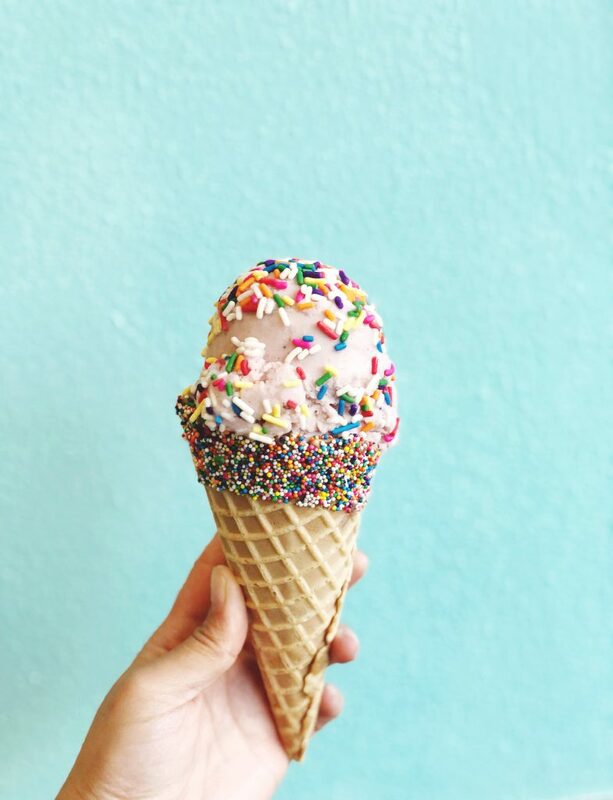 It would be great if they had a cream-based vegan ice cream option, but we will happily take what we can get. You can also order oatmeal here in the morning. Grizzly Jacks Bar and Grill is located at the outside pool. We haven’t personally ordered from here, but there are a few things that appear to be easily modified. Buckets – serves two snack options: hummus with pita bread and chips with fresh made salsa…which as you know from above is my favorite (and I am pretty picky when it comes to salsa!). 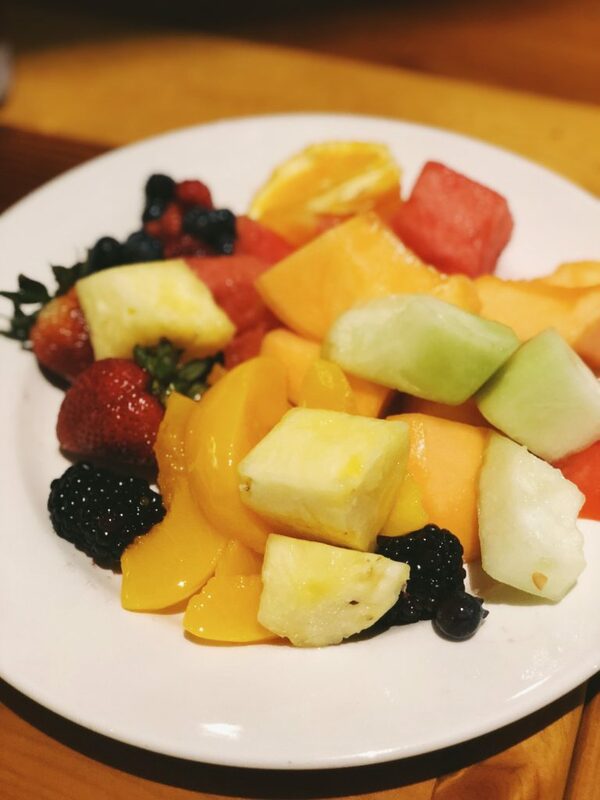 I definitely recommend calling or emailing the Lodge ahead of your stay, to notify them of your dietary preference/allergy/restriction. There is a small refrigerator and microwave in every room, so it is possible to bring your own food and snacks! There is also a coffee maker. 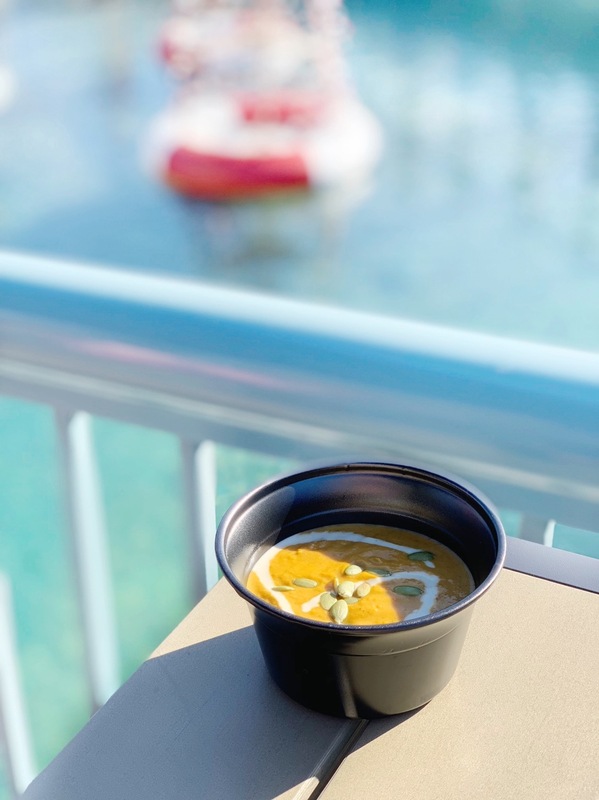 You cannot bring outside food inside the waterpark, but there are vegan options nearby! 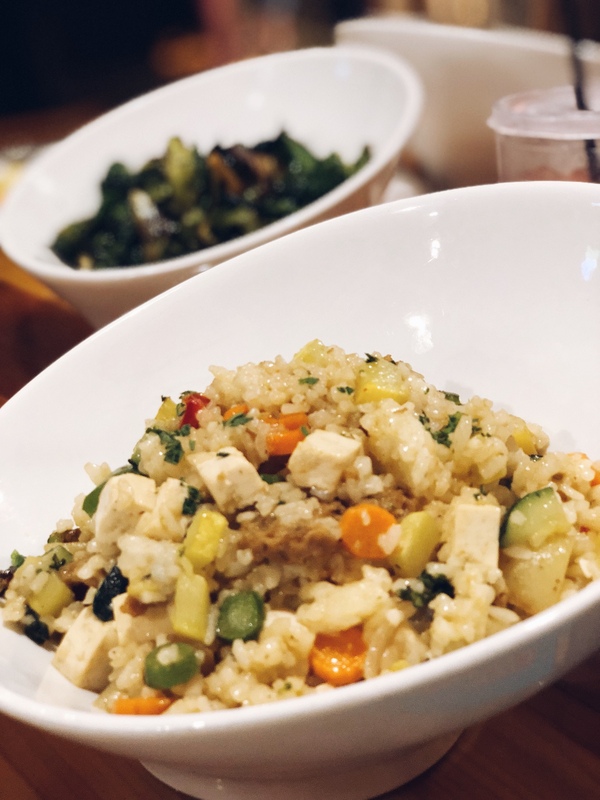 Door Dash Food Delivery – You can have food delivered from several local vegan eateries for just a few bucks. Our two favorites are Healthy Junk and Vegan Pizza, but there are a handful of others nearby. They will deliver right to the front lobby. They have a new food plan that you can purchase for each family member. We tried it for the first time during our last stay a week ago and we were happy with it. It was definitely a good deal for what you received. 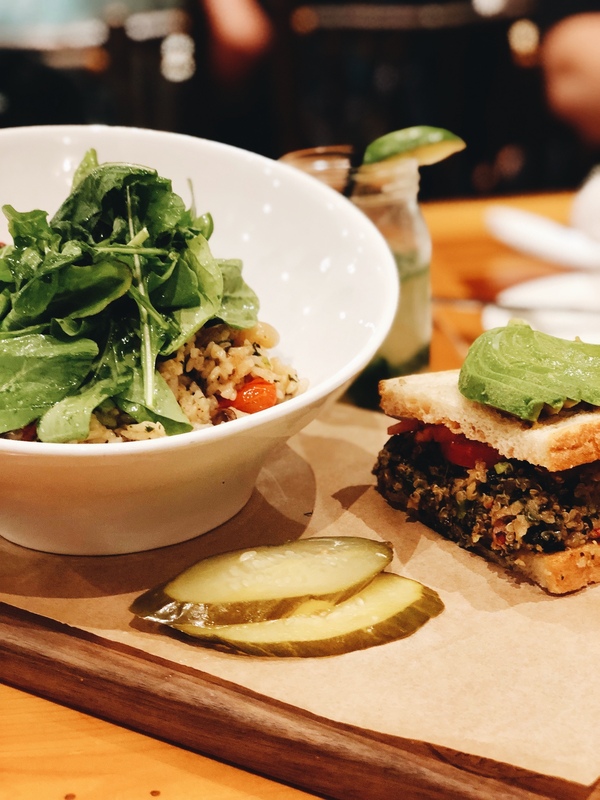 The Vegan Risotto at Lodge Wood Fired Grill is our favorite thing to order! 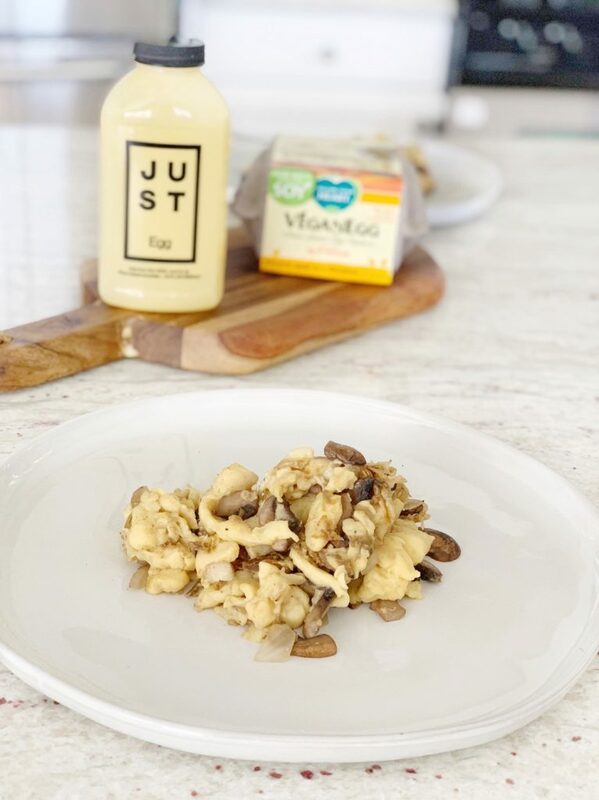 Vegan risotto is hard to come by and this doesn’t disappoint. Also pictured is a delicious house made quinoa burger. 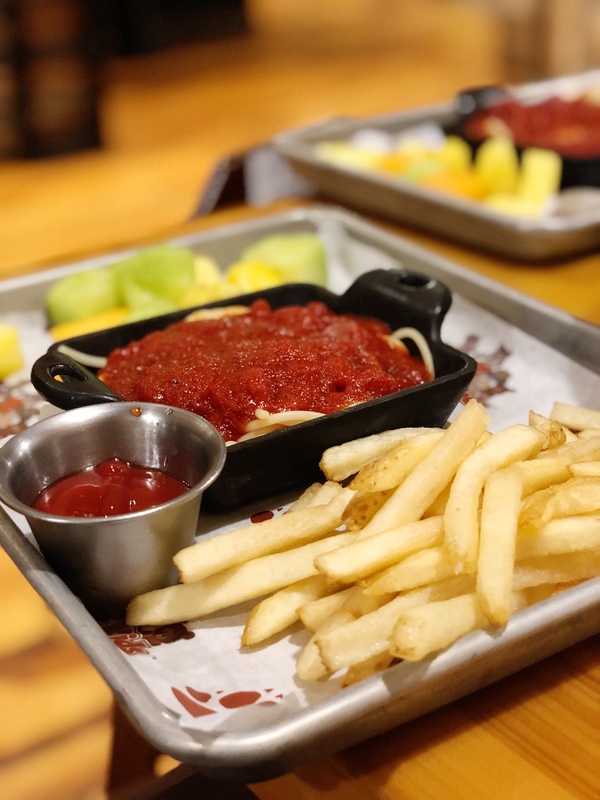 Kids meal – pasta with choice of side (fruit, fresh veggie sticks, fries). We have also ordered steamed veggies in the pasta, like carrots, broccoli and asparagus. 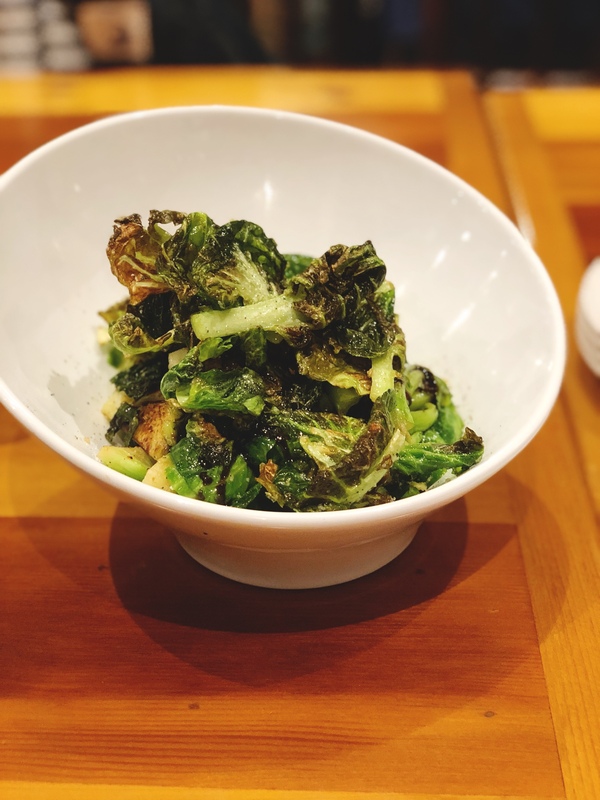 Brussel Sprouts – a modifiied side dish, hold the bacon. 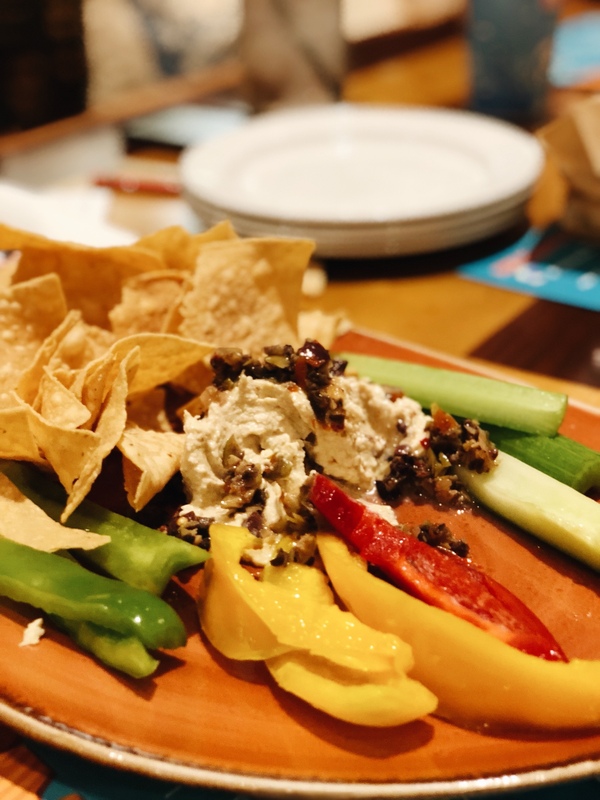 Hummus plate, topped with tapenade. Delish! Pasta with veggies! This is a split dish – portions are decently sized. More risotto – we order this every stay! 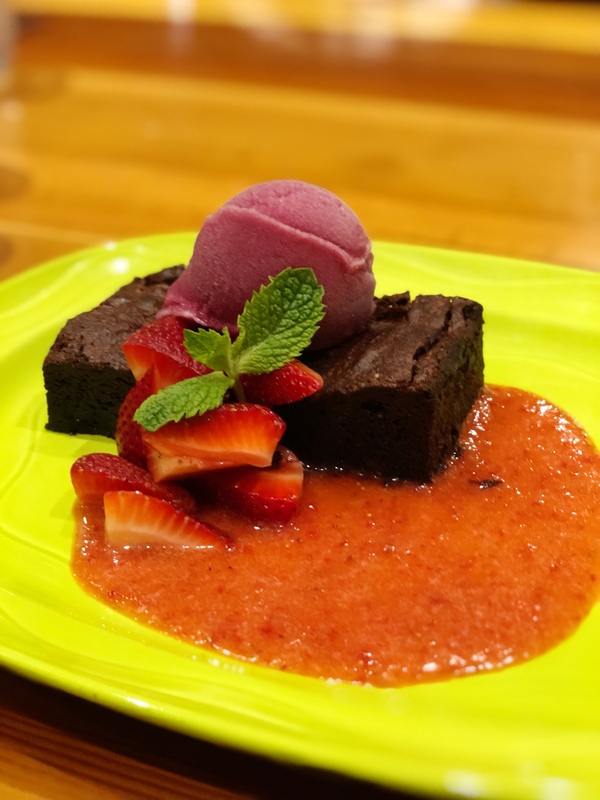 Beautiful vegan Brownie Dessert with raspberry sorbet. 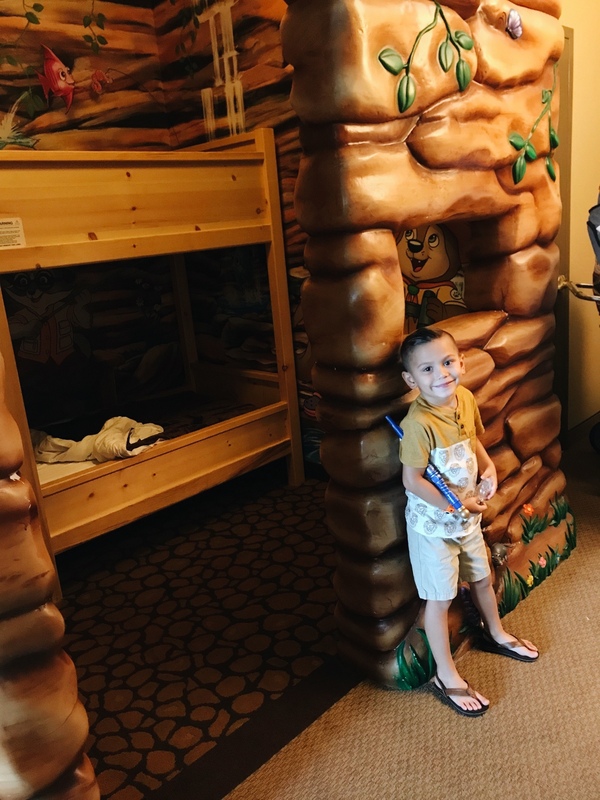 Excited little guy, playing with his Magi wand in his wolf den bedroom! There are also a few other items that we have ordered off the menu, like a Baked Potato, topped with guacamole and chives. Just be sure to mention your preferences to your server to see what modifications can be made. 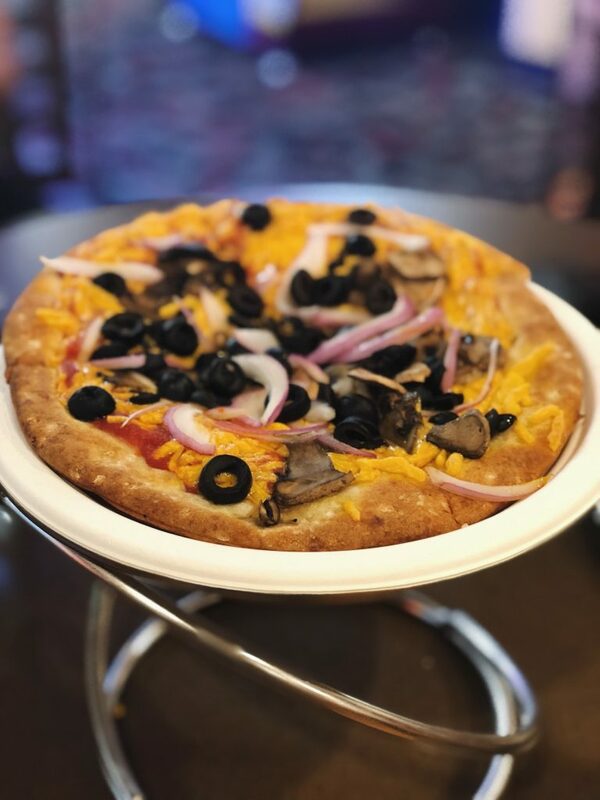 Veggie pizza – there are several veggies to choose from and sometimes vegan sausage! The vegan dough can be either GF or a regular vegan dough option, depending on which chef is working. 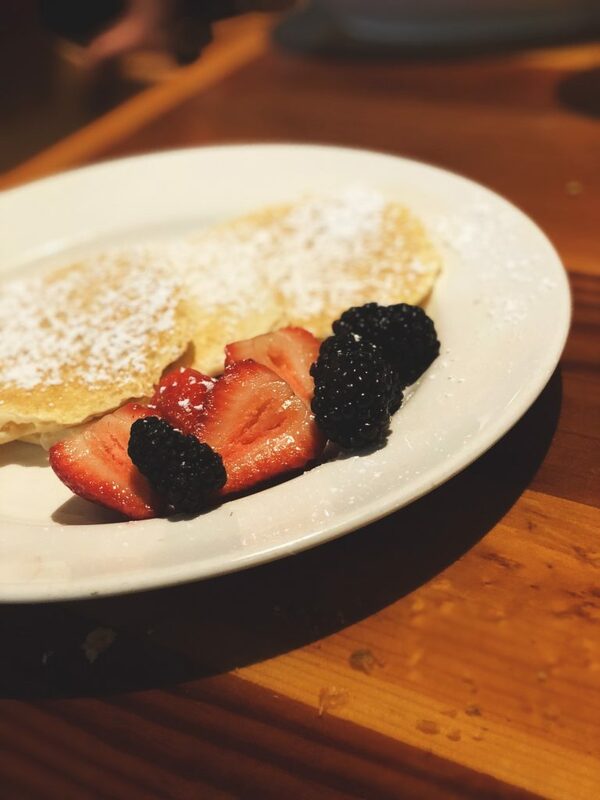 The Loose Moose Family Kitchen is our favorite spot for breakfast. They have the most delicious freshly made salsas that are perfect to top potatoes with! 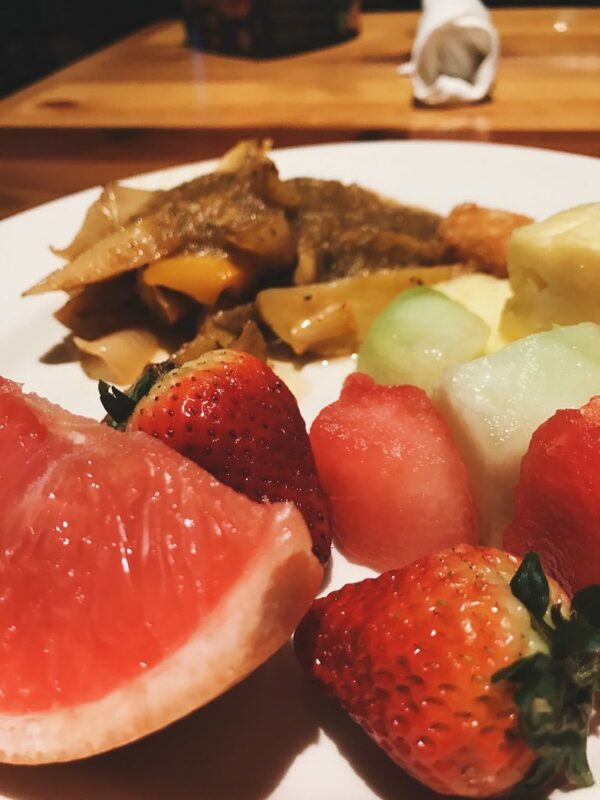 The buffet itself has an array of fruit, hash browns and oatmeal that are already vegan as-is. 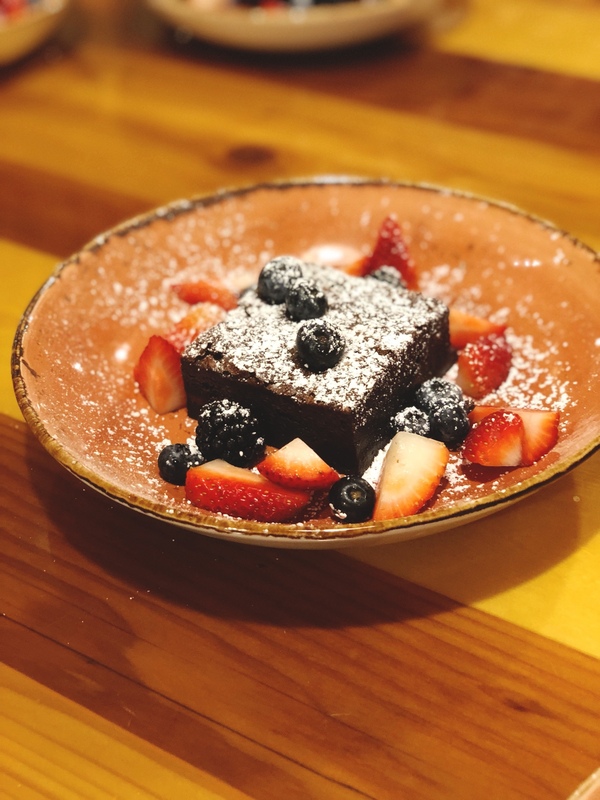 If you notify your server of your dietary needs, a chef will be more than happy to whip up something special. We have had pancakes, french toast, breakfast burritos, vegan sausage, tofu scramble and potatoes. And top everything with their delicious salsa. I’m not kidding! 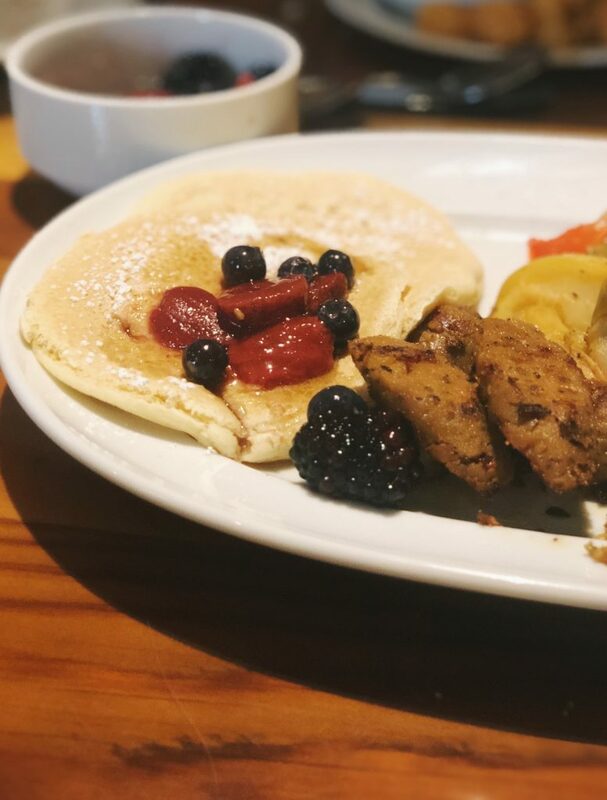 😉 These breakfast dishes aren’t typically available unless you visit a vegan restaurant, so it’s such a treat to come here and order these! 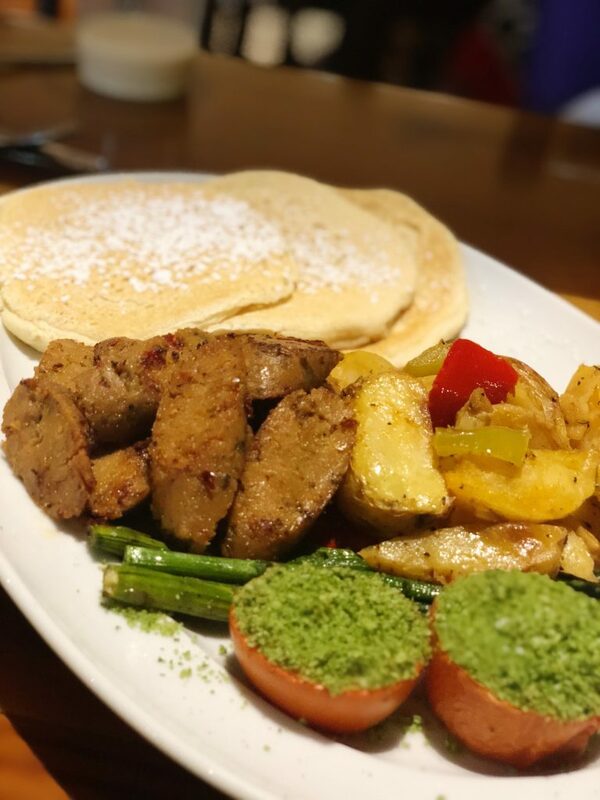 More vegan pancakes, sausage and yummy veggies! Be sure to ask for the country style potatoes freshly made, as the buffet option is cooked in butter. 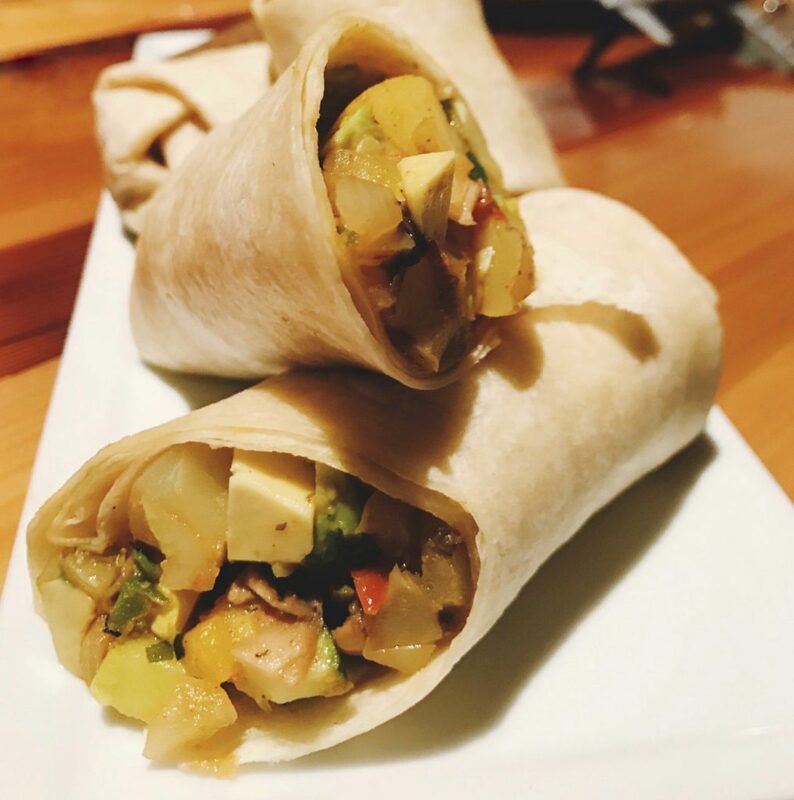 Breakfast burrito, filled with tofu, potatoes and avocado. 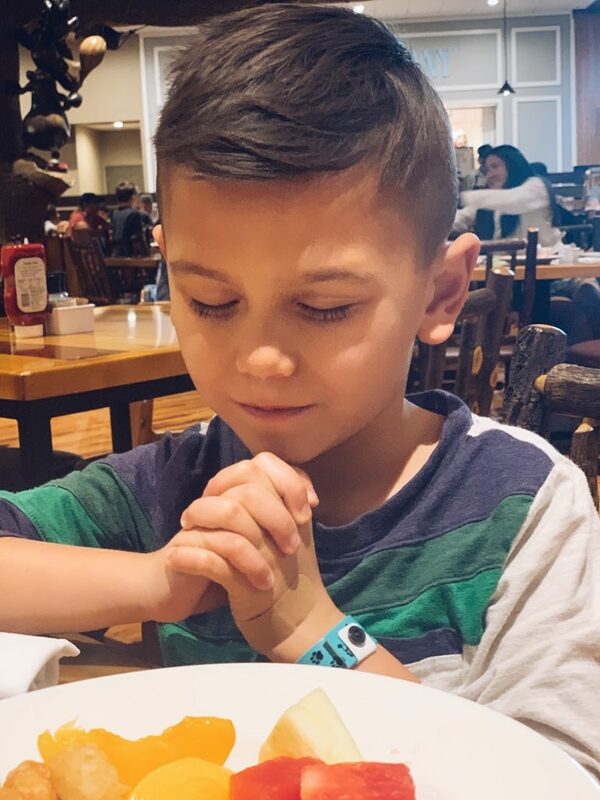 Sweet boy praying for his food! 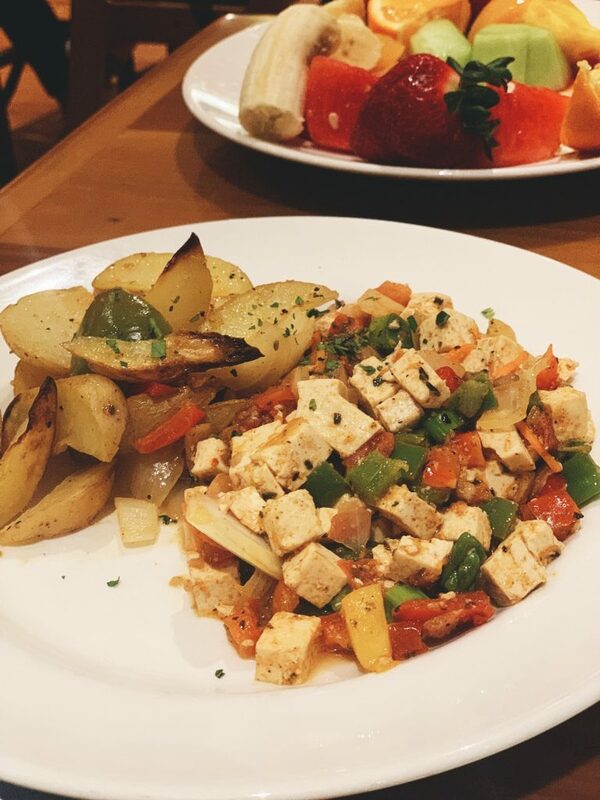 Breakfast tofu with potatoes and veggies. 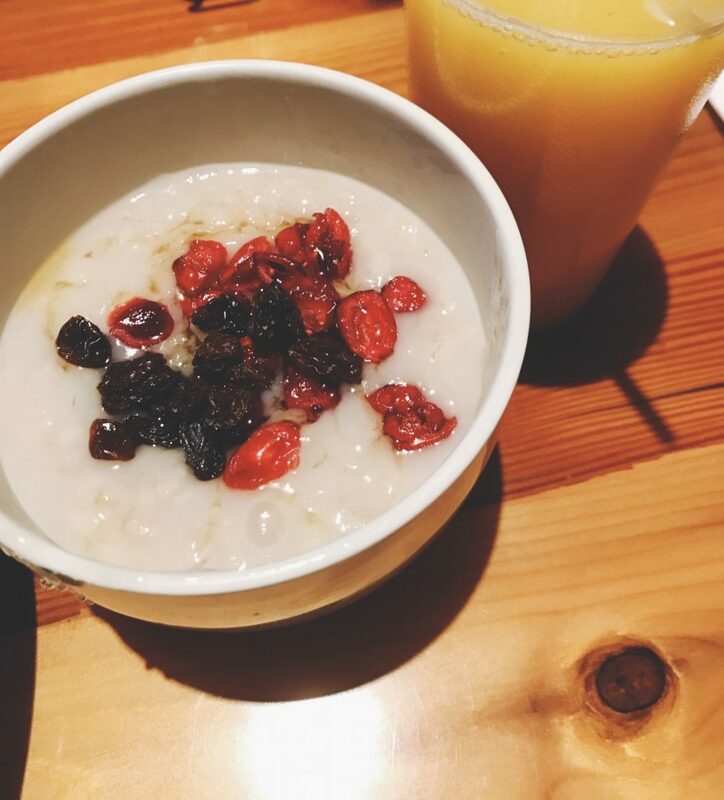 Steel cut oats – water based. 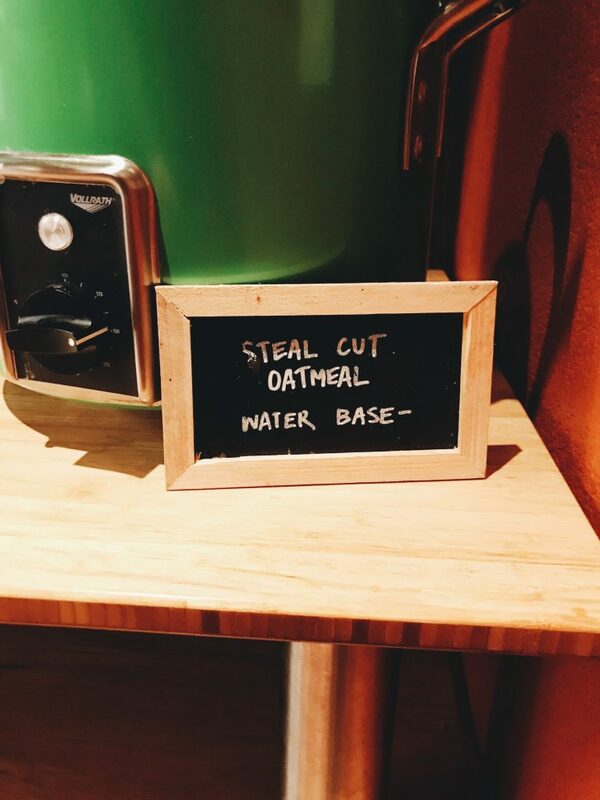 Oatmeal – available in sit-down down dining or at one of the quick order places. Enjoying the breakfast buffet with Wiley! 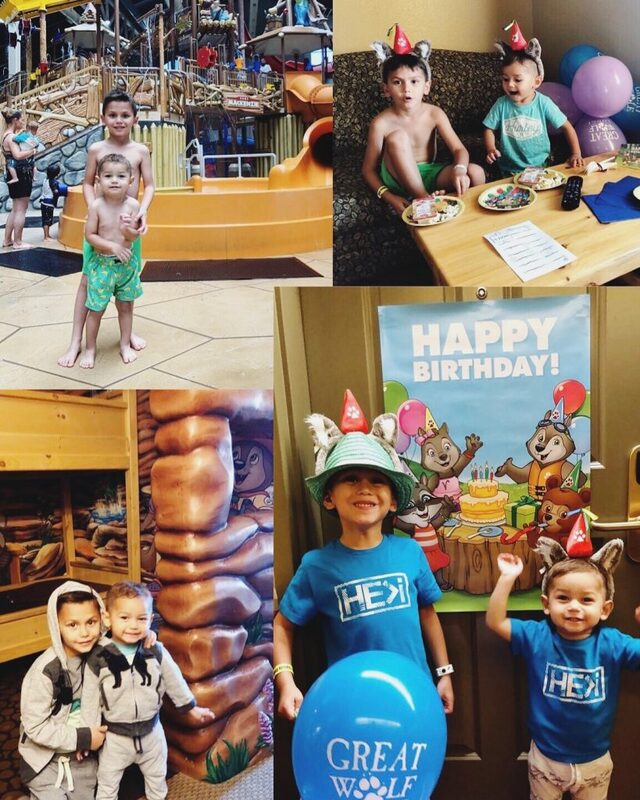 Here are our little guys when we visited for their birthday celebration last year. I know I have a picture of the boys with the infamous Chef Hany and both boys devouring their Dippin’ Dots, but I can’t find them in the 100k+ photos on my iphone! 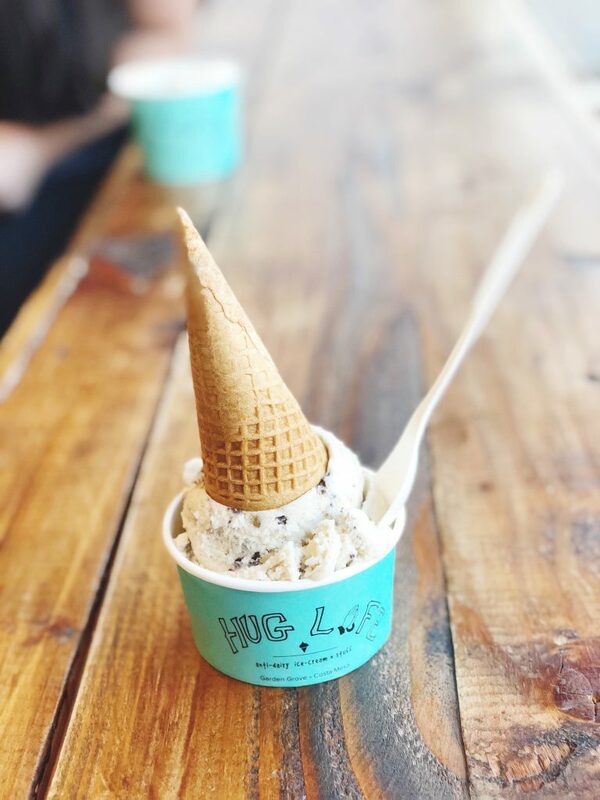 And we ALWAYS end our stay with a trip to Hug Life, which is the most amazing vegan ice cream located just a few minutes away. 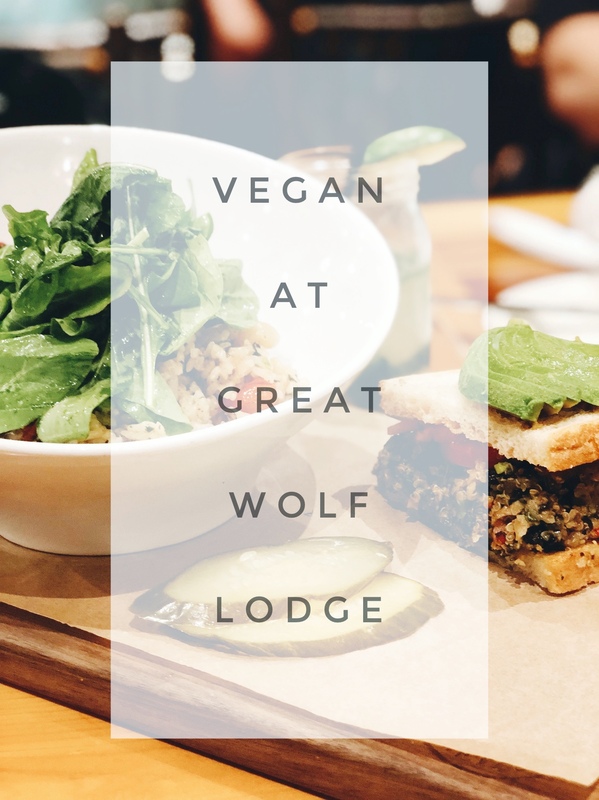 Hope you enjoy your stay and vegan deliciousness as much as we always do! I am happy to answer any questions, so send me an email if you have one! 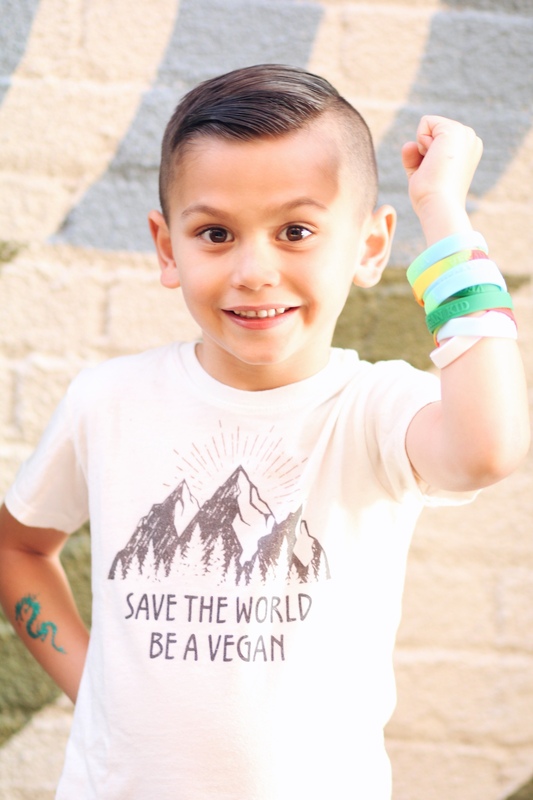 When my oldest was four years old, he asked me if he was the only vegan kid in the entire world. He only knew a world of playdates and church classes, where there was plenty of “No, you can’t eat that.” While he understood the foundation of why we chose to be vegan (and that eating any of the traditional snacks would result in a painful tummyache), I knew it was hard not to feel included at such a young age. While I believe it builds character and gives him something to be passionate about, hearing him say this broke my heart. 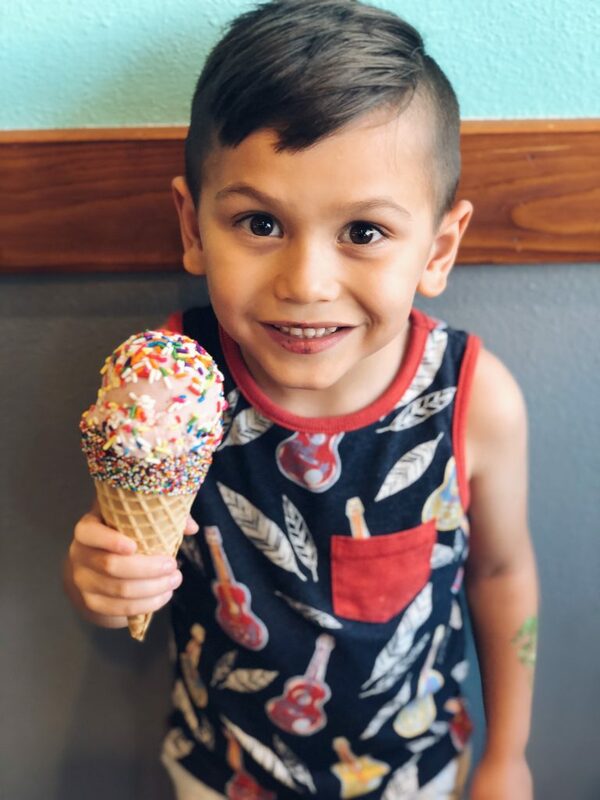 I have always made it my goal to have a comparable vegan option available for my kids and to connect with any vegan families when and if possible. 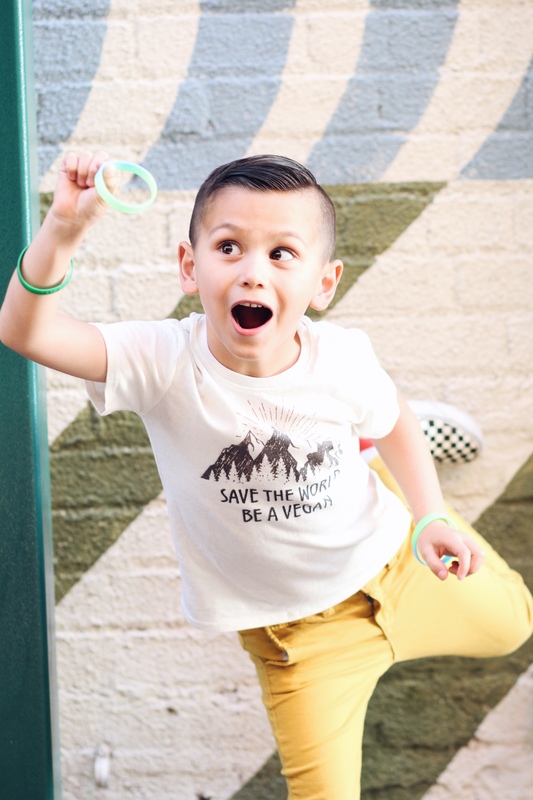 Because of all of this, I have always had the dream of making vegan kids truly feel that they are a part of something greater… something not exclusive, but incredibly inclusive and welcomed by everyone. 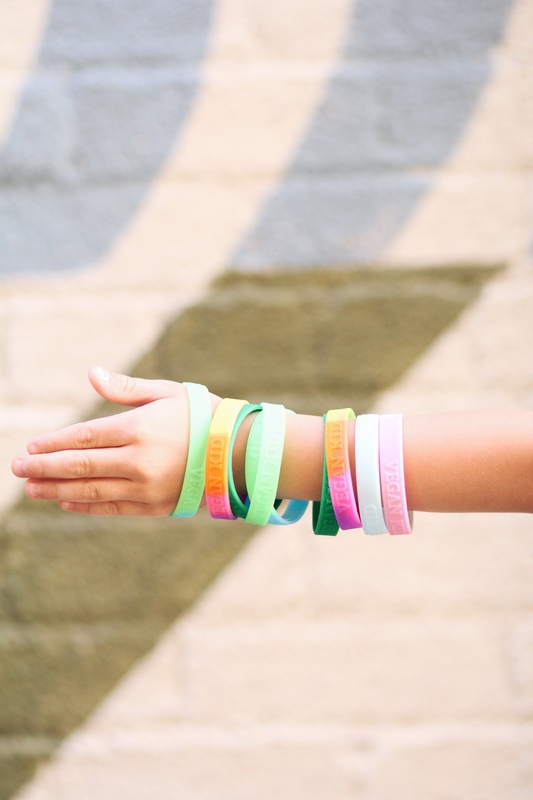 So my very first start to this dream are our VEGAN KIDS bracelets! I wanted my kids to have something fun that reminds them that what they are doing is incredibly special.. and makes for a great conversation starter! We’re offering these at a introductory rate for a short time–we are still figuring out the best way to get them to you at the best rate. 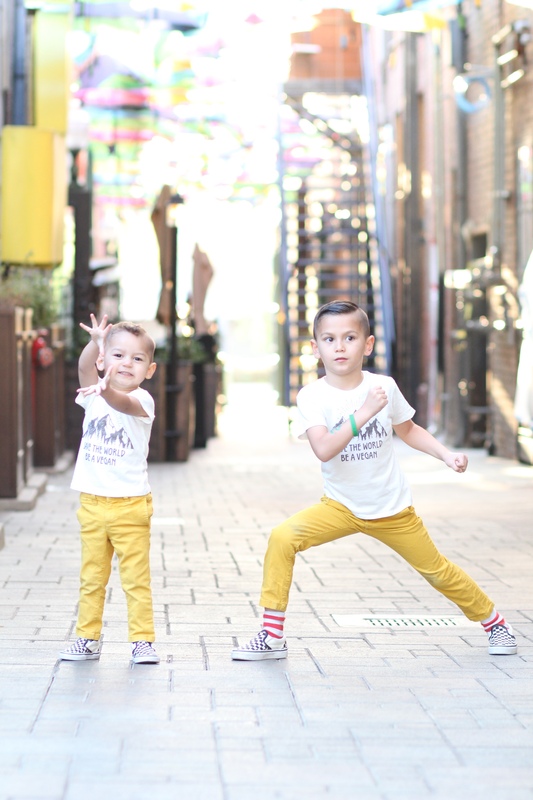 But we are so excited about having them and our kids have loved them so much already… and we couldn’t wait to share them with you! 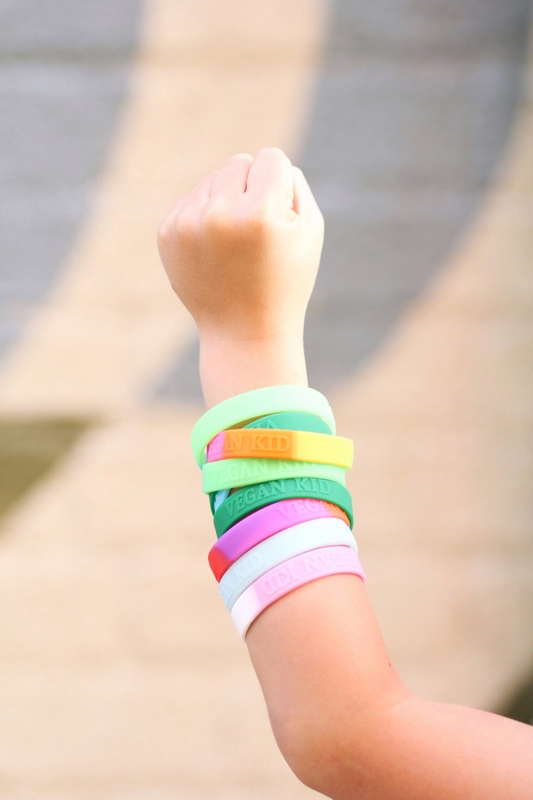 These are children’s sized bracelets, but they fit my wrist comfortably. Click on the link below to purchase! 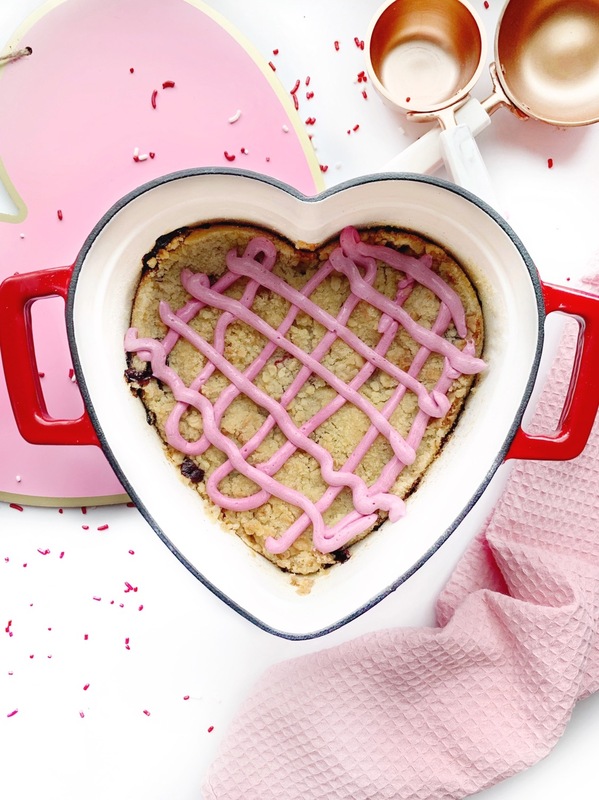 Something sweet for your sweets this Valentine’s Day! Try our simple Berry Crumble, with an out-of-this-world vegan cream cheese drizzle on top! It’s made with frozen berries, so this dessert can be enjoyed all year long. Preheat oven to 375 degrees. Butter a 9-inch pyrex dish. Gently combine berries, sugar, flour, cinnamon and vanilla. Place in prepared dish. Place flour, sugar and vegan butter into large mixing bowl. Mix together with a fork until it starts to crumble. Sprinkle topping over berry mixture, covering completely. Place in oven for 30-40 minutes, until crumble topping is lightly brown. Mix all ingredients together with hand mixer. Add food coloring. Add to crumble once cooled, with ziploc bag or by drizzling with a fork. February is one of my favorite months. Not only is it my birthday month, but it is the month of Valentines day as well.. which also means it’s a pricier, thought-inducing time for my husband — who has two occasions to buy his wife gifts for! 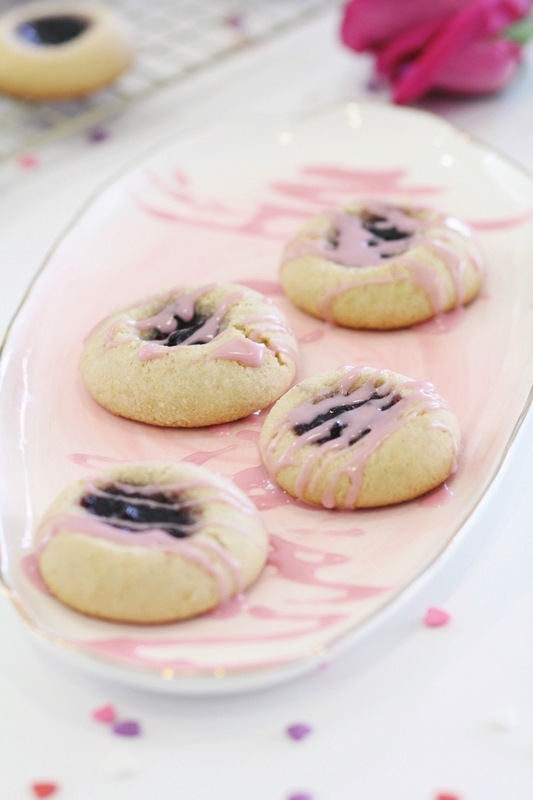 I can’t let the sweetest holiday go by, without sharing our very favorite cookie recipe. 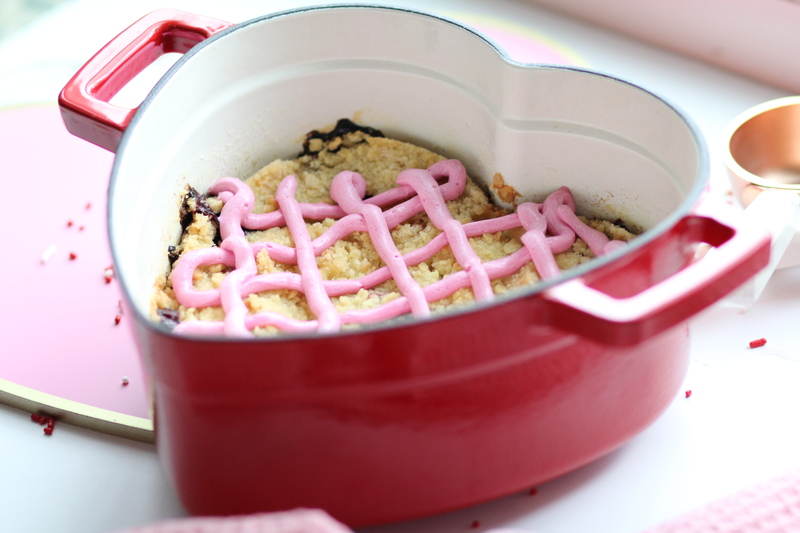 If you love almond or marzipan, this Almond Shortbread Cookie is definitely the cookie for you! Almond flour combined with coconut oil, gives this cookie a delicious marzipan-like texture. 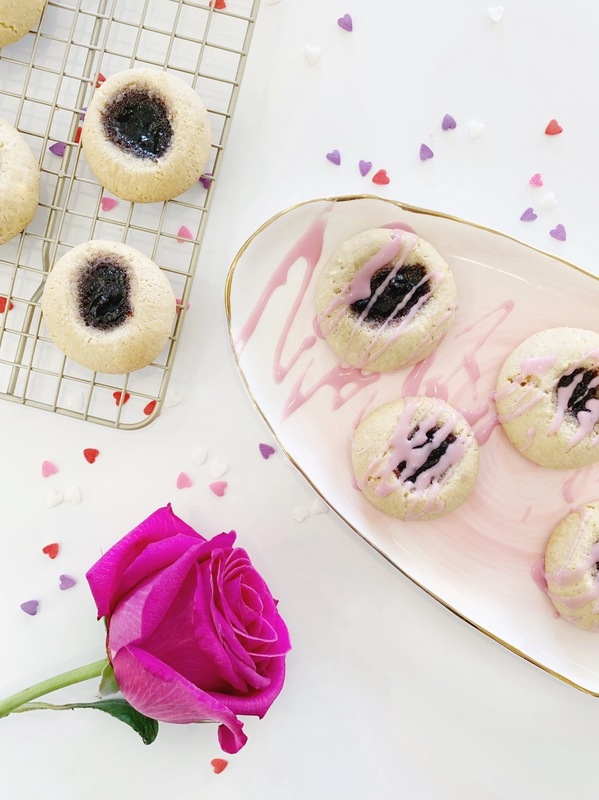 And to make it even more fun for the kids to make, we make them into a thumbprint cookie – complete with whatever jam of your choosing. My brother and my new sister-in-law visit Cambria often, which is a town off of the coast of California. They always bring back Ollalieberry goodies, which happened to be the jam that I had on hand (and made for a delicious cookie!). But these would be just as great with something like a raspberry or cherry jam. In a large bowl combine all ingredients. Stir, until ingredients are just mixed together. Roll dough into 2 inch balls, and place on un-greased cookie sheets. 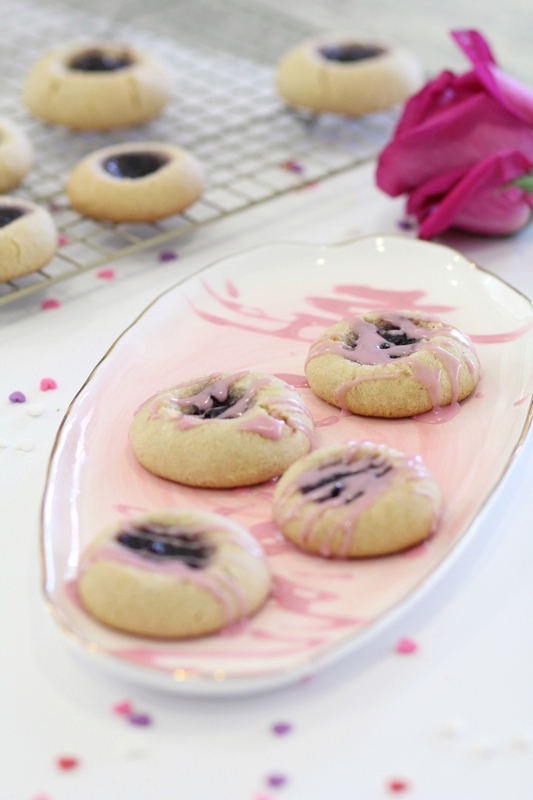 Make a small hole in the center of each ball, using your finger (These cookies won't spread). Fill hole with jam of your choice. Mix together the powdered sugar, 1/2 teaspoon almond extract, and plant milk until smooth. Add more or less to get the consistency that you want. Add in food coloring - I use a powder form (made from beets!). Drizzle over cookies with a fork, or by cutting the bottom tip of a ziplock bag. Ever had a craving for something, but not want to spend the entire afternoon in the kitchen? I love making foods from scratch, but seeing how far vegan food items have become readily available in the past few years makes me appreciate being able to buy them. And that’s exactly where my love for Trader Joes comes in (no, this isn’t sponsored, I just have a genuine love for the place 🙃) and every single ingredient in this recipe was purchased from there. And thus, I give you “Five Minute Banana Bread French Toast.” Seriously, impress your friends for brunch, vegan or not, on a whim. 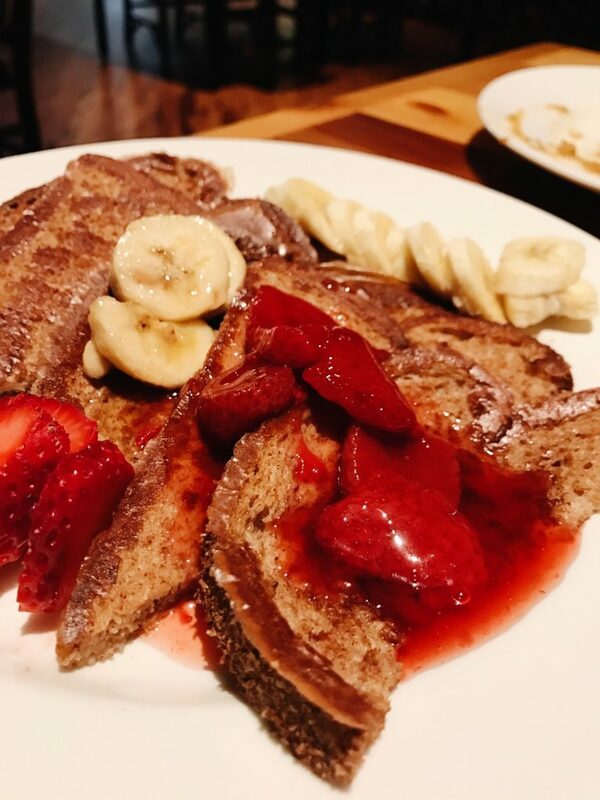 Impress your friends for your brunch, with this five minute french toast, made from Trader Joes Banana Bread. Cut banana bread into slices, about 1" thick. In a shallow bowl whisk non-dairy milk, vanilla and cinnamon. Melt vegan butter in large skillet over medium heat. Dip each slice of bread into the liquid mixture (on both sides), then place in heated pan. Cook on each side until golden brown (about 3-4 minutes). Top with dusted confectioners sugar, fresh fruit, vegan whipped cream and chocolate drizzle (instructions below). Add chocolate chips and coconut oil to ceramic bowl, put in microwave for 25 seconds. Remove from microwave, stir and put back in for another 25 seconds. 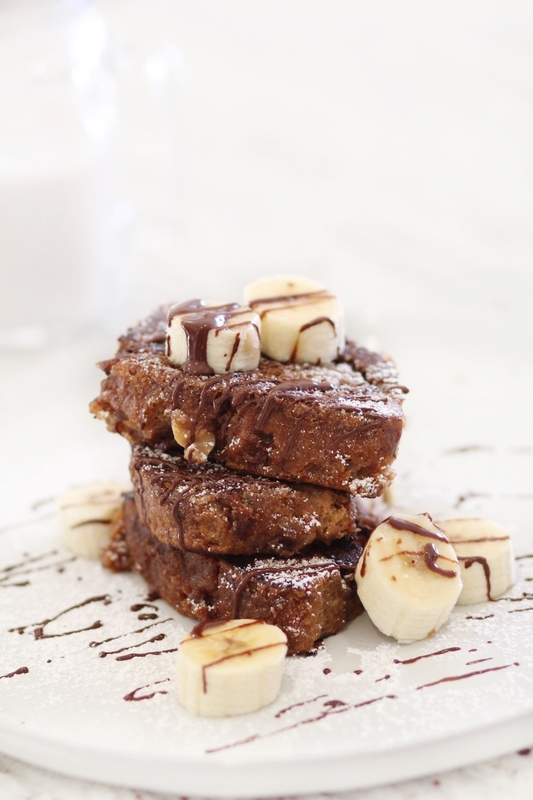 Drizzle over french toast with a fork and serve immediately. ps – be sure to follow @plantbasedmomma on instagram and facebook for more vegan goodness. 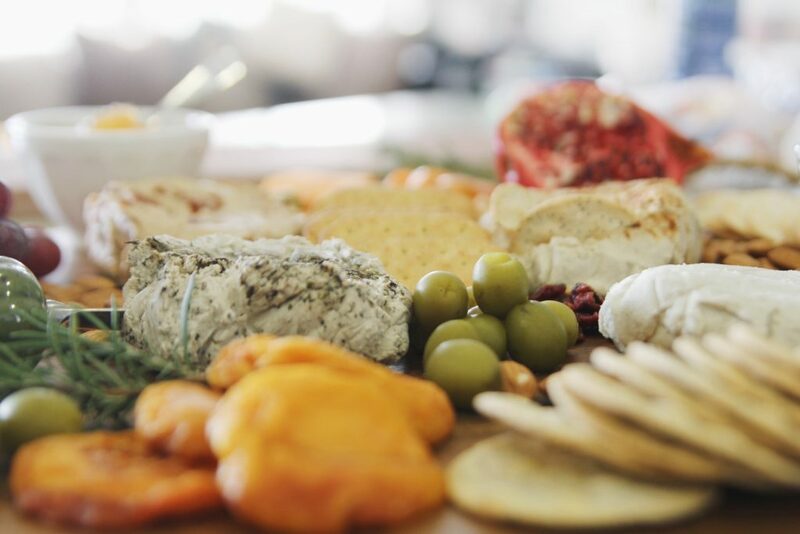 There are a lot of vegan cheeses to choose from on the market these days – which is an incredible dilemma to have. 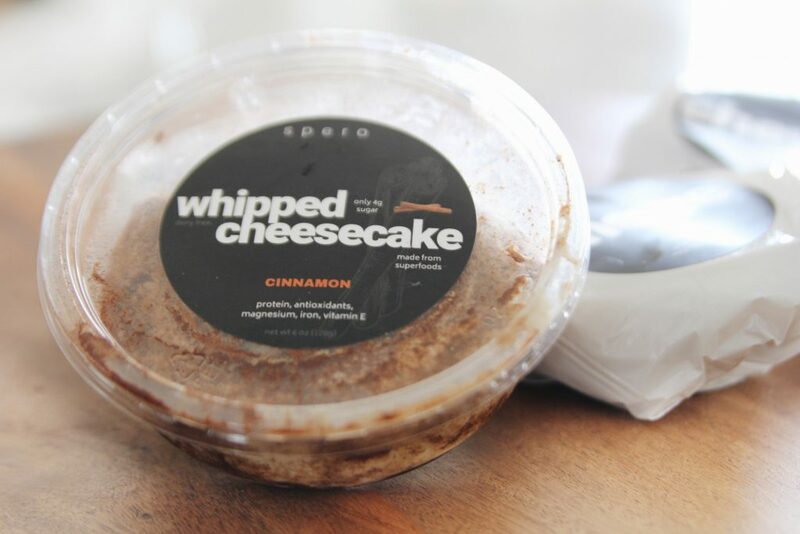 But if you have never heard of Spero Foods before, this is a bandwagon you will likely want to jump on. 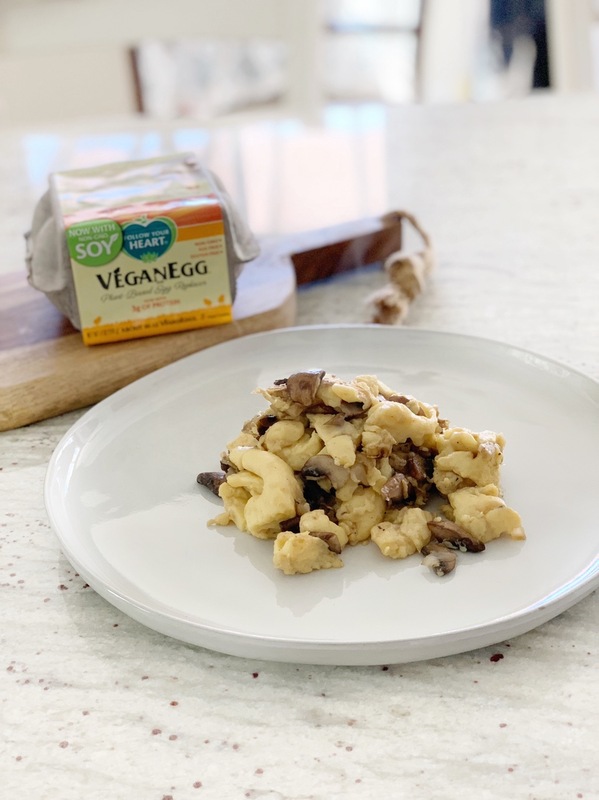 You already know that we are fans of their vegan egg and of their healthy and sustainable philosophy. On top of that, they are plant based, made from totally clean ingredients, without unhealthy preservatives that you probably can’t pronounce (and free from soy, gluten and nuts!). They are also an impressive nine times more sustainable than dairy cheeses. 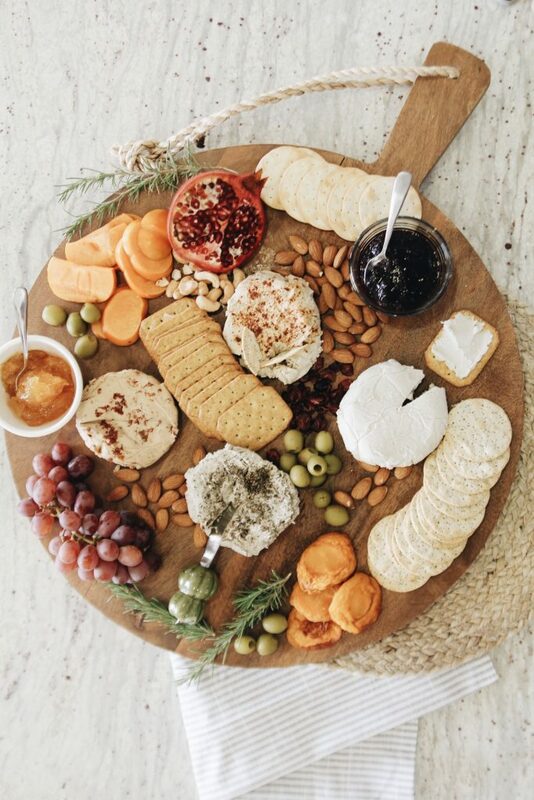 Aside from all of that, these cheeses are AMAZING. If I haven’t stressed it enough, you will undoubtedly want to bookmark this company in the back of your mind. We shared our provisions with our extended family and they were completely stunned. Everyone’s favorite, hands down, was the “Goaty Chèvre” which was remarkably similar to the real thing. 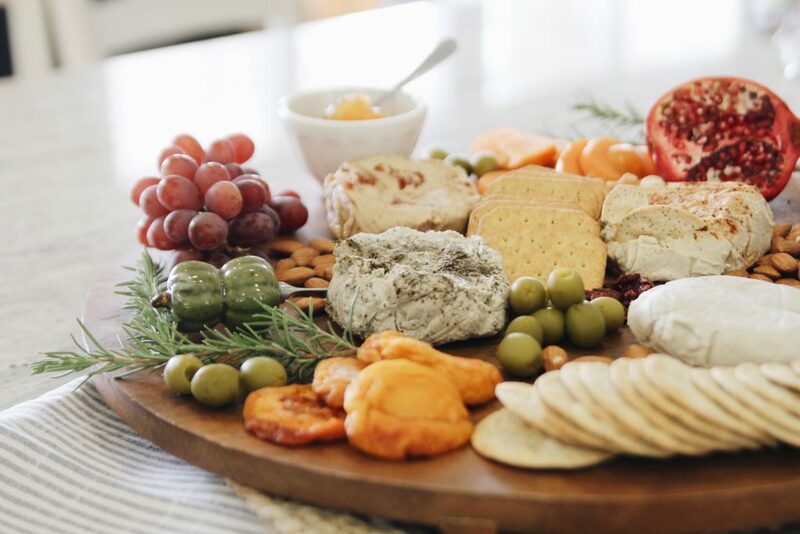 I am still amazed by the flavor and the fact that everything used to concoct this masterpiece of a non-dairy cheese was made from entirely clean ingredients. 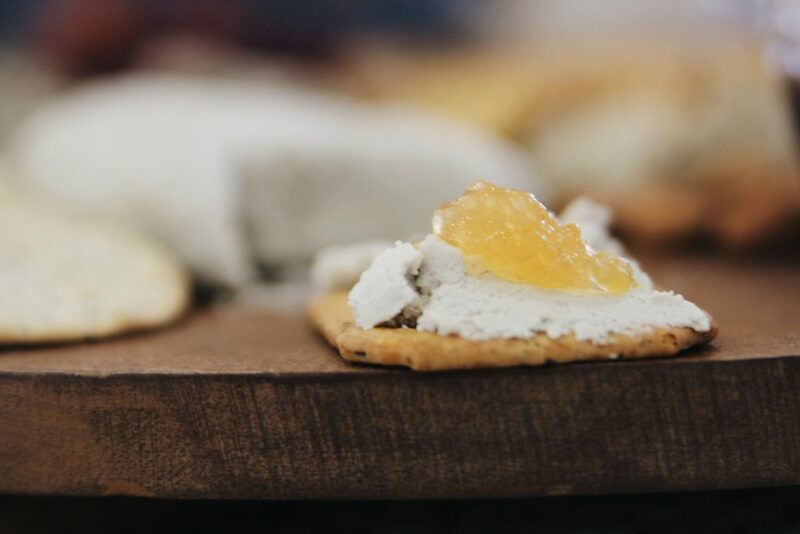 Our favorite combo was pairing the Goaty Chèvre with a peach jam. The different flavors of chèvre that we enjoyed were Sun Dried Tomato, Smokey Chipotle, Goat and Herbacious. I am really looking forward to trying their new Camembert, as well. 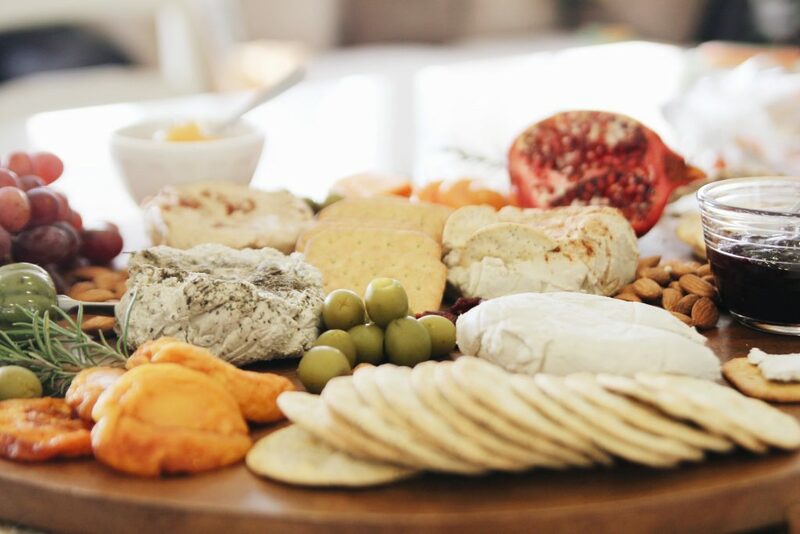 These cheeses can be used on a platter, in or on pasta, soups or in any recipe that calls for a gourmet cheese. 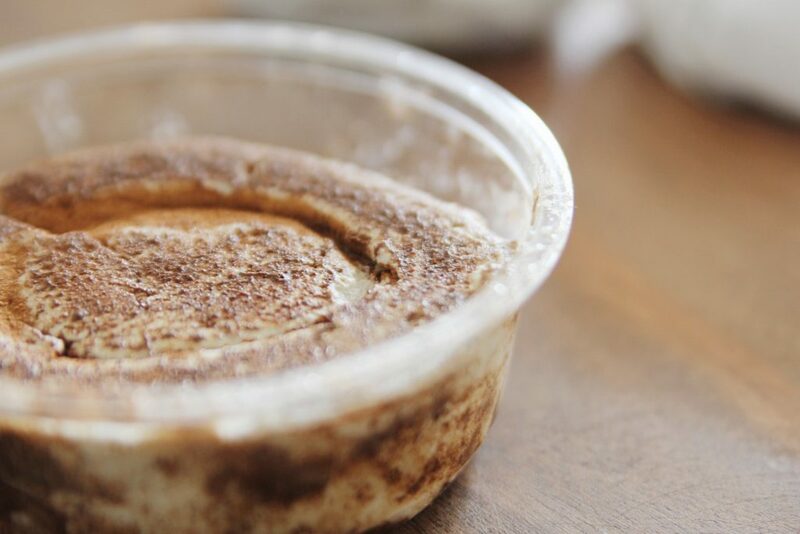 And the icing on top is this gorgeous Whipped Cinnamon Cheesecake. It is as beautiful, rich and delectable as it looks. 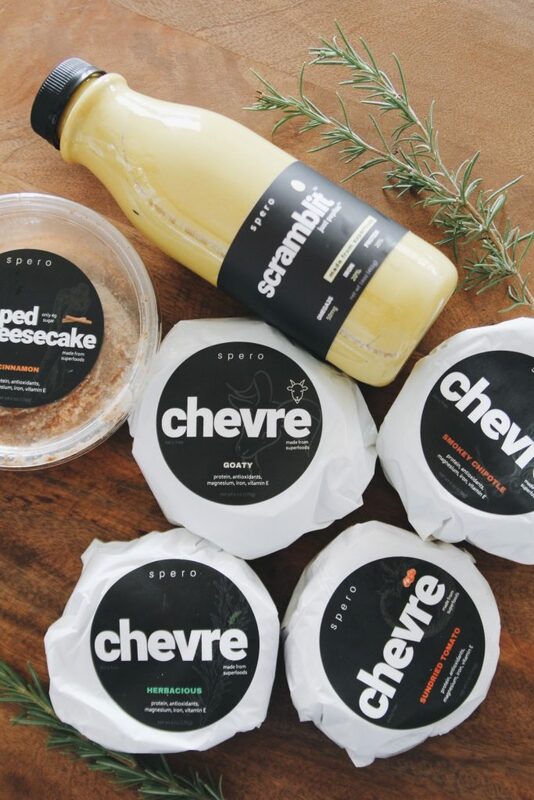 Spero Foods is absolutely changing the face of veganism and sustainable living and I am so glad that they exist. 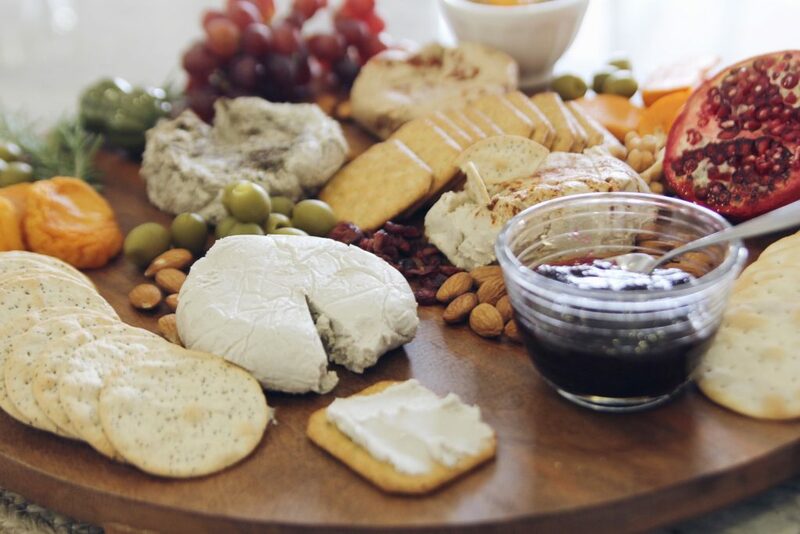 Vegans can undoubtedly rejoice in a delicious cheese plate again. 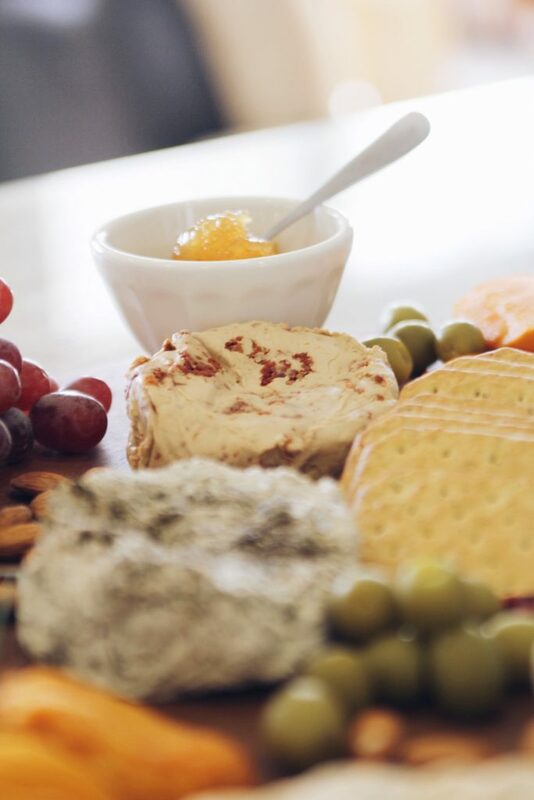 You can wow your dinner guests with something impressively vegan, or enjoy it as a delightfully rich and gourmet snack by yourself. I can’t wait to see what the future has in store for this great company. **I received product in exchange for my honest feedback and opinion. I only share products that I absolutely love and believe in. A very vegan Christmas at Disneyland! It’s the most beautiful time of the year at Disneyland…and let me tell you: they did not skimp on their gifts to vegans this holiday season! 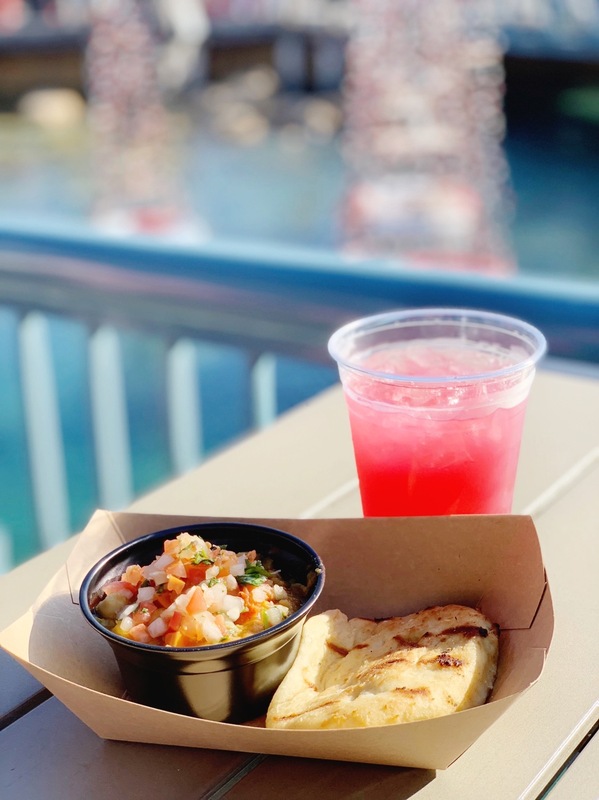 This season has by far had the most vegan friendly offerings of any Disney special event. If you were contemplating going, now is the time. 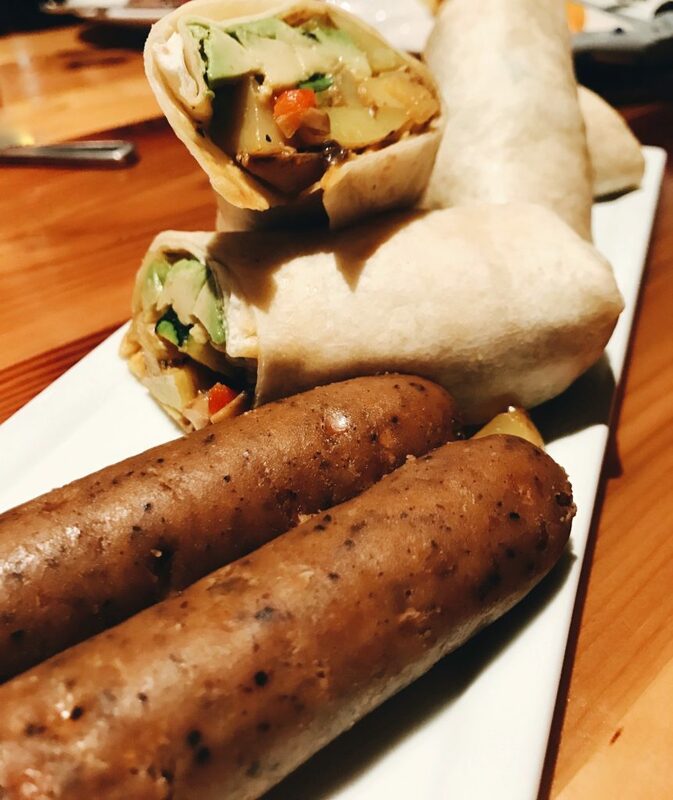 On top of all the new delicious seasonal additions, there are a handful of new vegan items that are a permanent fixture on their menu as well. This comes right after releasing an entirely plant-based menu for World Vegan Day. The progression is amazing and is so appreciated. Thank you, Disneyland. 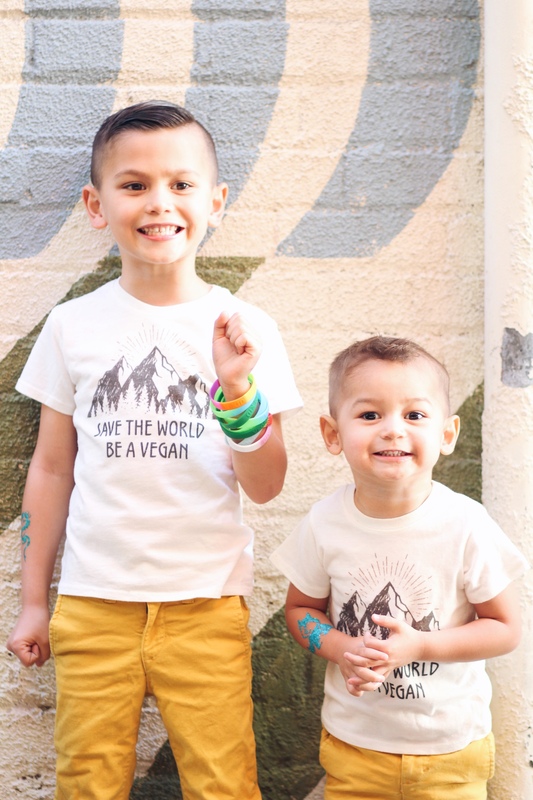 Our vegan kids appreciate it more than you can imagine! Here are some of the holiday options that we thoroughly enjoyed. Scroll all the way down to see what my very favorite was! This was the husbands favorite dish of the day. It was deliciously loaded with flavor and we were so excited to have vegan naan. 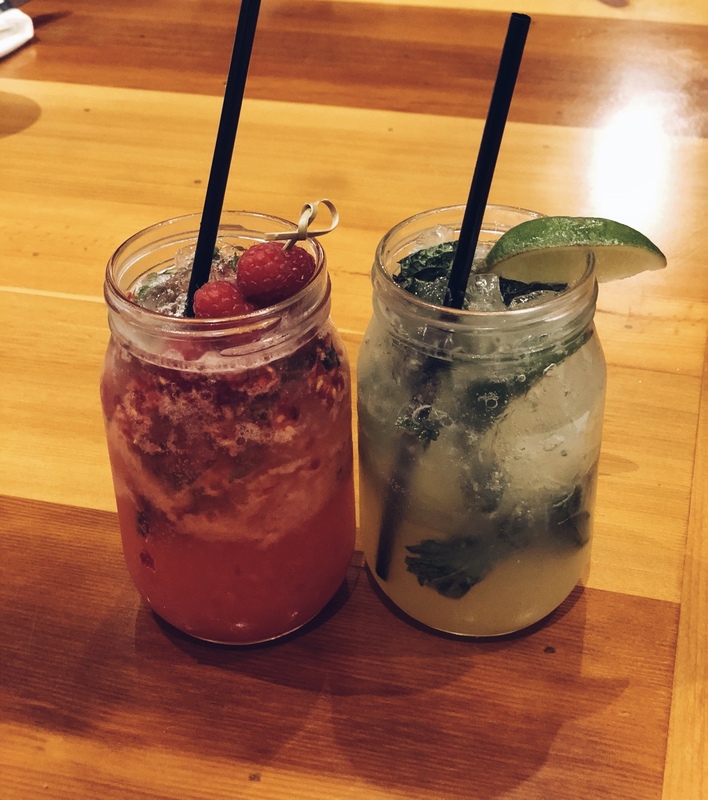 The pomegranate lemonade was a huge family favorite. It was so loved that we went back for another round of refreshing seconds. 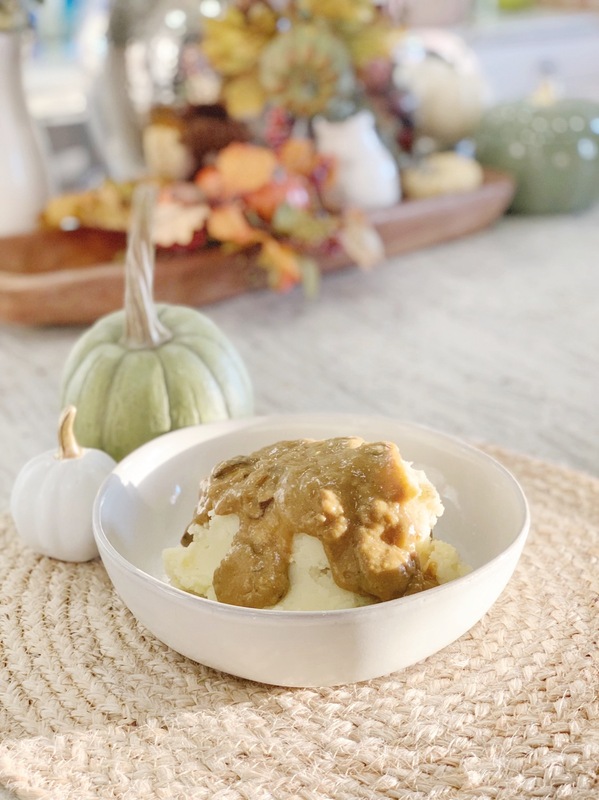 This pumpkin soup was packed with holiday flavor and a delicious addition to their vegan menu. This dessert was the most anticipated from our trip. The two words vegan and dessert do not usually go hand in hand at Disneyland. We are lucky to have a few miniscule options, but nothing as loaded as this tangy deliciousness. 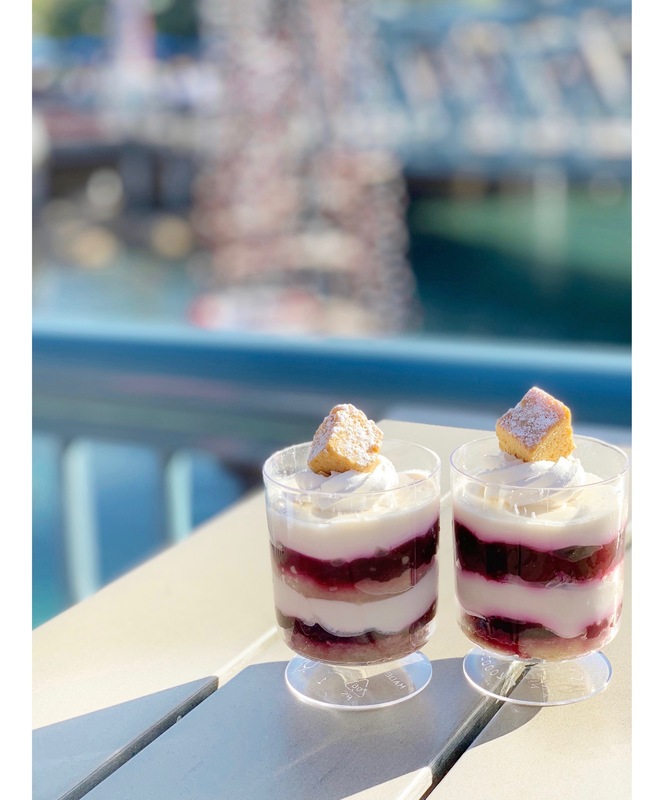 We’re crossing our fingers that Disneyland continues with the vegan dessert offerings.. because what is a trip to Disney without a lot little bit of sugar. 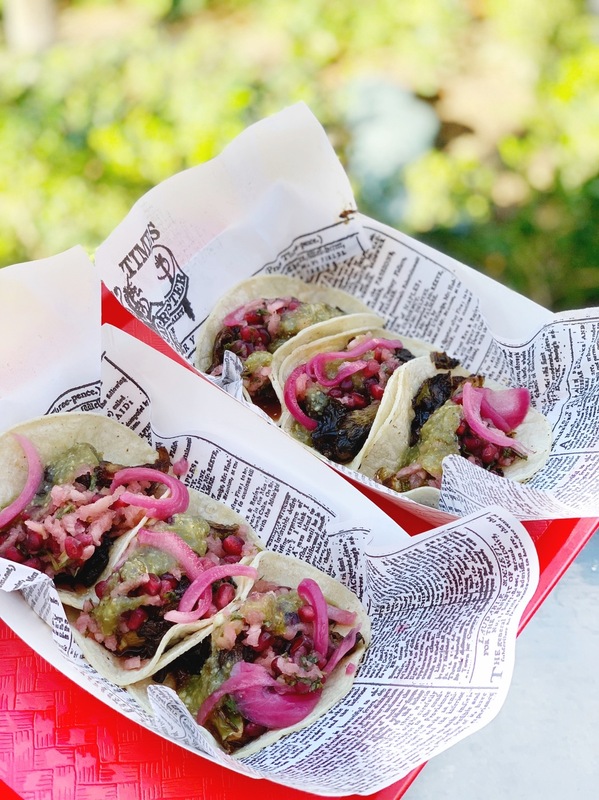 As an avid and self-proclaimed taco connoisseur, these were by the far most interesting tacos I have ever tasted. I intentionally didn’t read anything about them beforehand and was totally surprised by the fresh pomegranates. They were an interesting addition and completely lended to the holiday flavor. My absolute favorite dish of all of the holiday offerings was this gorgeous chile rellano! 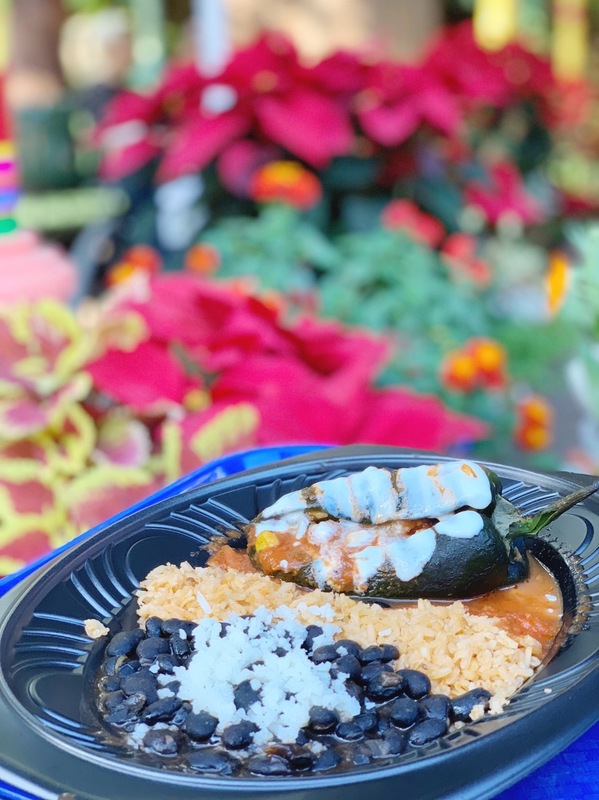 A roasted poblano stuffed with veggie stew and served with spanish rice and beans. It was literally stuffed with a multitude of flavors, that all complemented each other so well. The most amazing part is that as a vegan or vegetarian, it is so rare to be able to eat spanish rice, since it’s traditionally flavored with chicken broth. So anytime I can order it vegan, I appreciate it so much more than I ever have. And while not a holiday offering, but a permanent menu fixture, Hungry Bear Restaurant in Disneyland, has now added the Beyond Burger! 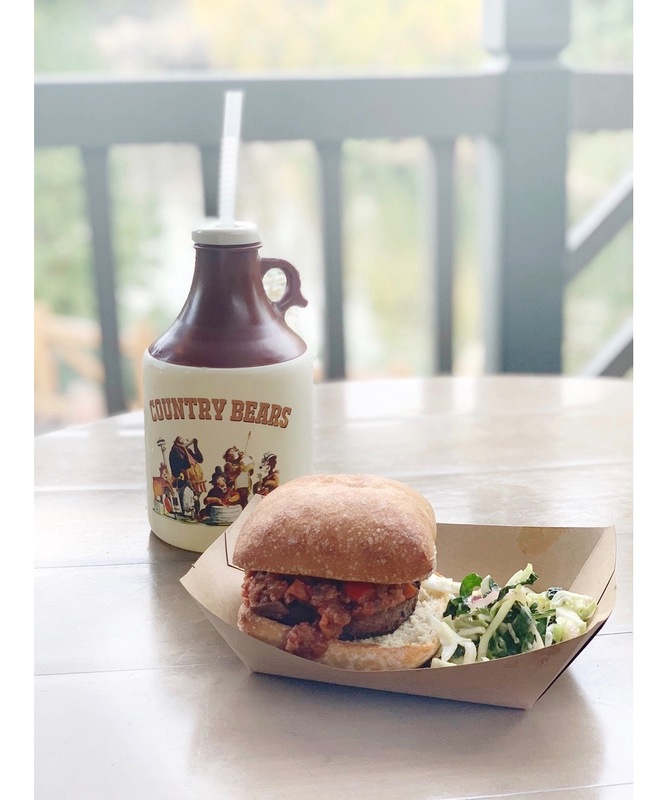 You can grab this “Messy Melvin’s Vegan Specialty Burger” in Critter Country. Disneyland now has a decent selection of veggie burger, as this joins their house made patty and the Impossible Burger, which is a secret menu item at Lamplight Lounge in DCA. 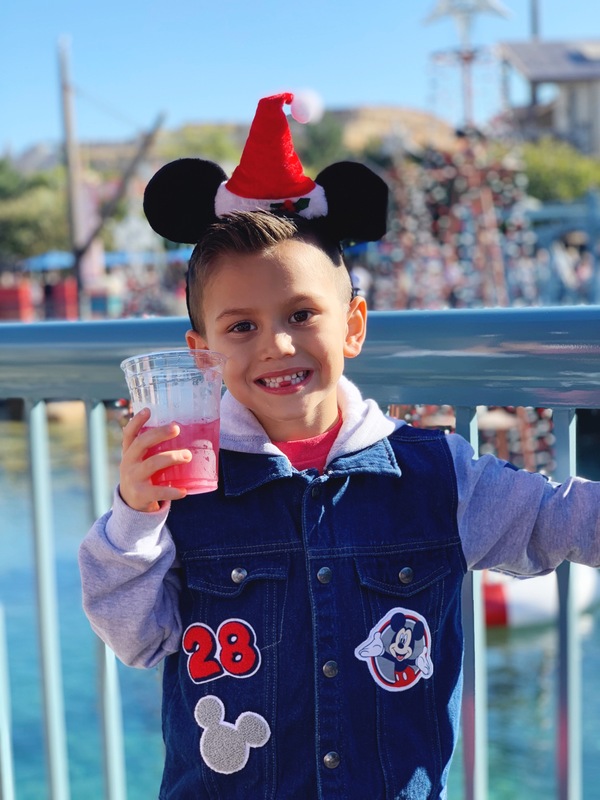 Here’s one of our happy vegan kiddos, thoroughly enjoying all of Disneyland’s vegan gifts to us this holiday season. We are incredibly hopeful that this is just a taste of more awesome vegan things to come! 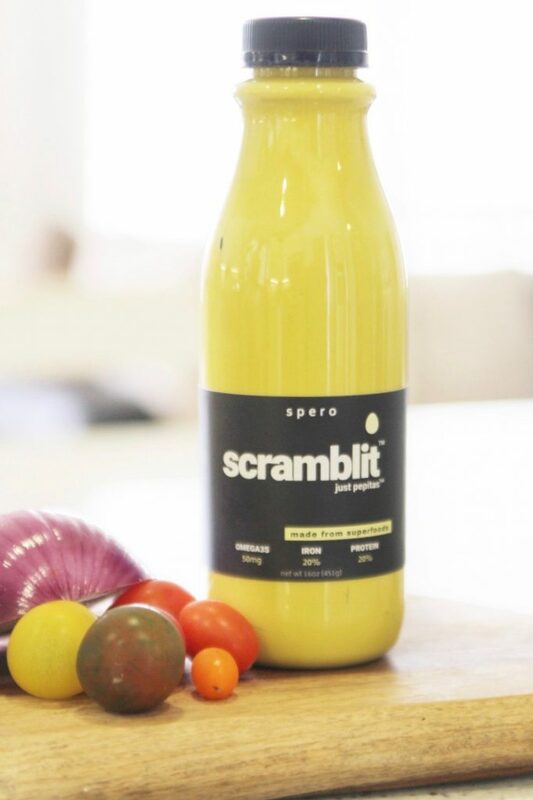 After our “Great Vegan Egg Showdown” I was pleasantly surprised to learn about a new awesome company, Spero Foods. What has inexplicably stood out to me the most is not only the flavor, but their passion for wholesome plant based alternatives. 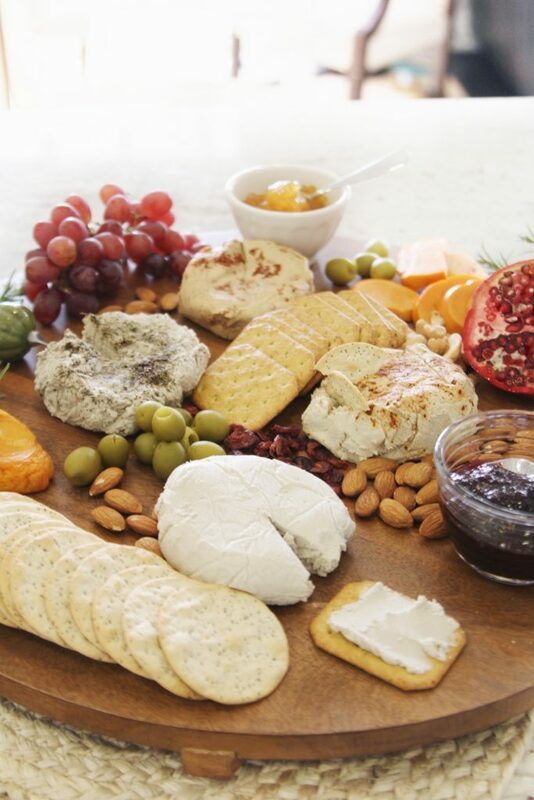 All of their products have ingredients that you can pronounce…which means NO additives or preservatives. Simple, wholesome and real plant-based goodness. I love love the concept of this company and I feel good about feeding this food to my children. It genuinely is just plants. 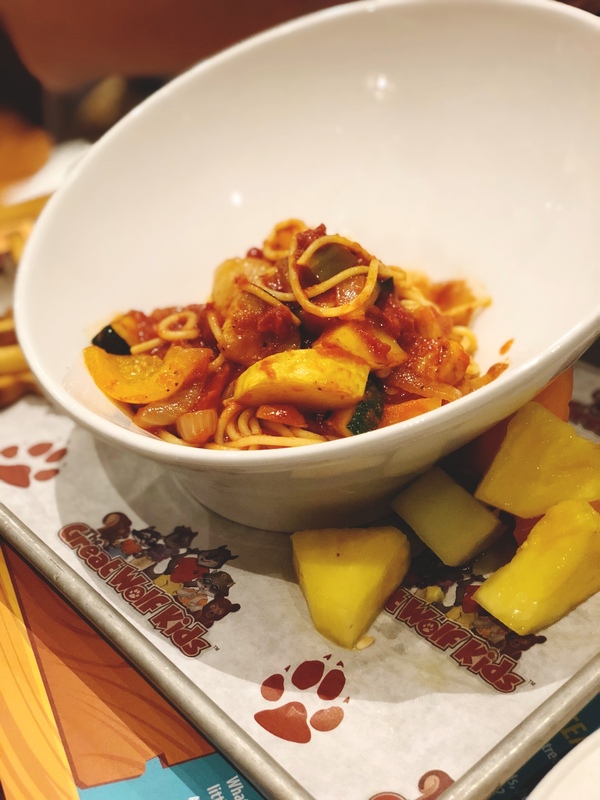 And on top of their impressive background and their promise for food without compromise, the food tastes unbelieveable (and stay tuned because there’s more than egg – and we got our extended family in on it!). We enjoyed their Scramblit, with sauteéd veggies, sprinkled their “Black salt” (which will be available soon) and topped wih avocado and their Sundried Tomato Chevre. The similarity is unbelievable and the texture was on point. Our family was so impressed and I am absolutely the newest and biggest fan of this company. The secret ingredient to creamy vegan mashed potatoes! Thanksgiving is almost here and I couldn’t be more excited! Our family loves every single traditional dish.. so even if I’m not hosting dinner at our house, I make (or buy!) all of it so that my family can enjoy everything, without compromise. 1/4 cup Vegenaise or any other Vegan Mayonaise Secret to the creaminess! Fresh Garlic **I don't add in fresh garlic when making for my kids, since it's "spicy"
Drain and Mash the Potatoes. I also use a hand mixer, but it's not necessary. Add all ingredients to the potatoes; mix and taste to desired flavor and thickness. Saute mushrooms, onion, and garlic until soft and translucent, about 5 minutes. 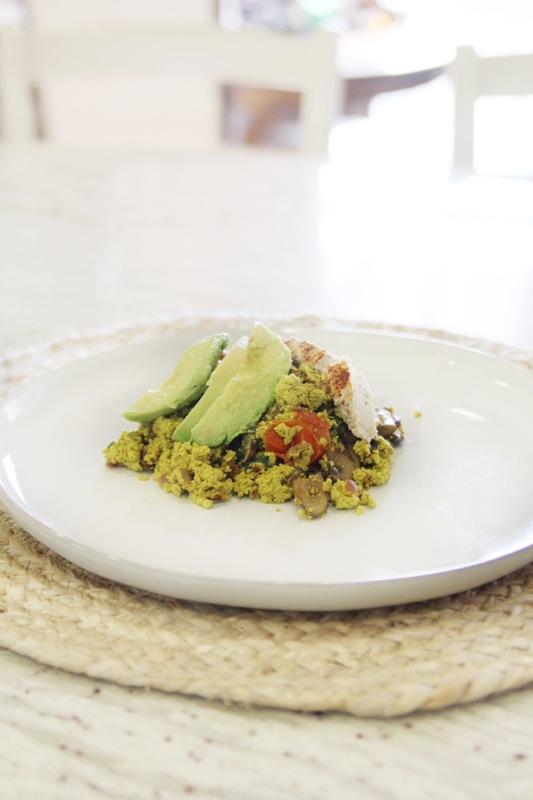 While sautéing these ingredients, "toast" your dry nutritional yeast in another saucepan for 1 minute, over high heat. Set Aside. After onions and garlic are translucent, stir in flour, nutritional yeast and soy sauce to form a smooth paste. Gradually whisk in the broth. Season with salt and pepper to taste. Bring to a boil. Remove half of the gravy and place in a high speed blender until completely blended. Return to sauce pan. Reduce heat and simmer, stirring constantly, for 8 to 10 minutes, or until thickened. I posted an Instagram story last week of our first time using Just Egg in a scramble. It was such a crazy day that I forgot to follow it up and update everyone. I received so many messages asking what we thought so I figured I would give an update. 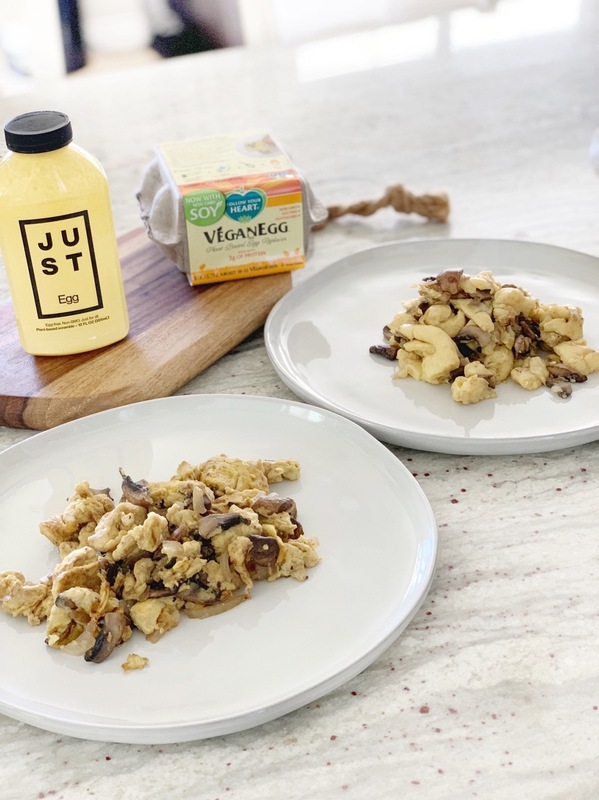 And to make it interesting, since I always have Follow Your Heart Vegan Egg on hand for baking, we thought it would be fun to do a side by side taste comparison. 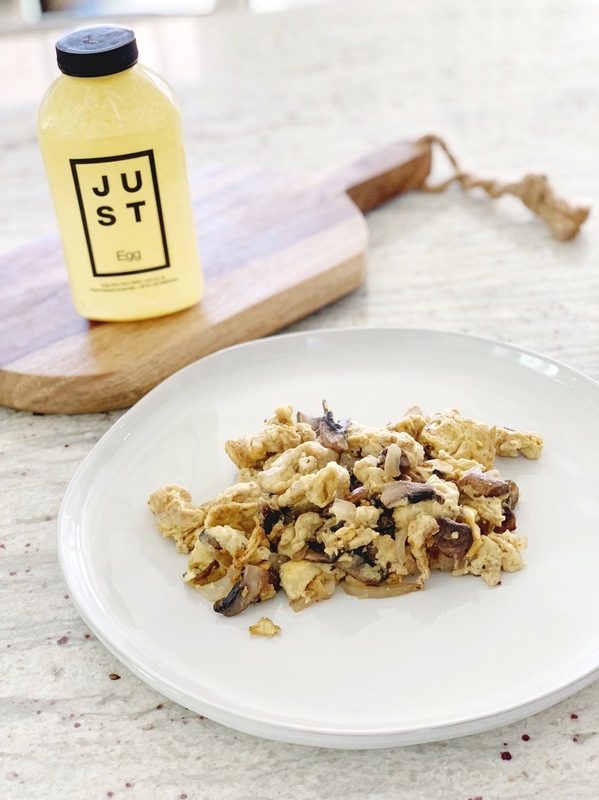 Just Egg: Everyone has been highly anticipating this product for the last few years, us included. Made primarily with mung beans (of which I am a fan, being part filipino) this egg had a sweet undertone, which eventually disappeared after a few bites. The texture and smell were pretty close to what we remember the real thing being like, making it more realistic for someone craving an actual egg. The downside is that there were no baking directions on the bottle, whereas FYH has simple conversions readily available. The biggest bonus is that it is ready to pour for quick and easy egg access. FYH Vegan Egg: Definitely has that sulfur egg flavor and smell. It has the typical runny egg consistency and texture when eating. We already know that it bakes really well, but the downside is you do have to mix it with ice cold water before you can bake or pour it in a pan. To a seasoned vegan, this isn’t that big of a deal, who likely has experience with mixing flax eggs or any other vegan egg replacer. Another impressive contender. All in all, we were impressed with both products and are incredibly happy to have these two great options available to us. My personal winner was the Just Egg. I think it’s an easy purchase for vegans and non-vegans alike (possibly looking to lower their cholesterol or cut down on animal products). However, since I haven’t tried baking with it quite yet (that’s a blogpost for another day) I will say that I have been been incredibly happy with the baking results of FYH egg. Both options make veganism so simple and readily available and I am so glad that we have options at all. I will happily use both products and continue to show family and friends how simple eating vegan can be.